This is my sixth ACC Basketball Preview. To view my previous entries, click on “more” beside my username, then select profile. After two years of historic NCAA Tournament success, the ACC suffered a major disappointment in March as only one of the conference's nine participants made it to the second weekend, a failure only partially offset by North Carolina's National Championship. Three of those nine teams, including North Carolina and Duke, face significant roster turnover, and there will again be a team likely to struggle so much in non-conference play that it hurts the league's ability to gain extra Tournament berths (although the team providing that service is new and a little surprising). A major recruiting scandal at Louisville is likely to change their postseason outlook as well. On the other hand, the ACC again landed 20% of the top 100 recruits in the country, while Josh Pastnor quickly revitalized Georgia Tech and Kevin Keatts will attempt to do the same for NC State. Overall, the top of the league will be loaded once more, although repercussions at Louisville could leave the ACC with as few as six or possibly seven NCAA Tournament bids. Dec. 29 Update: Despite unexpected struggles at Wake Forest and Georgia Tech, the ACC performed extremely well in non-conference play. Combined with the fact that Louisville seems to have somehow avoided a postseason ban, there is again a very real possibility of eight or even nine teams appearing in the NCAA Tournament. Devon Hall and Isaiah Wilkins are senior leaders that do just about everything for UVA. Virginia suffered from an identity crisis at the offensive end a year ago with the influx of high end young talent and the departure of senior leaders Malcolm Brogdon, Anthony Gill, and Mike Tobey. They still managed a solid (yet disappointing relative to the previous three seasons) fifth place finish, but that was marred by a humiliating 65-39 loss to Florida in the second round of the NCAA Tournament. The Cavaliers will again lose a senior leader in London Perrantes, but that young talent is still around and should be vastly improved as a group of sophomores and redshirt freshmen. In the wake of Perrantes’ departure, Devon Hall (8.4 ppg., 4.4 rpg., 37.2% 3pt.) will provide senior leadership after doing just about everything for the team as a junior. Hall is a natural point guard, but at a sturdy 6-5 he’s able to defend anyone on the perimeter, and he even held up well when asked to play power forward for extended minutes in smaller lineups. Hall improved dramatically as a scorer both inside and out, and he may be the team’s best post scorer. The more spectacular players to watch on the perimeter will be sophomore’s Kyle Guy and Ty Jerome, both of whom flashed tons of potential at times (and disappeared at others) as freshmen. Guy (7.5 ppg., 49.5% 3pt.) started to live up to his five star billing for short periods of time almost from the beginning (he averaged 15.5 ppg. in 11 double digit efforts and just 3.7 ppg. in the other 23), while Jerome (39.7% 3pt.) burst onto the scene at midseason with five double digit games after late January. Both are impressive shot makers that can also penetrate off the dribble and want to take the big shots, something that both may eventually be capable of doing better than Perrantes. Increased minutes and opportunities (and a year in the weight room) should help both become more consistent. The Cavaliers added a fourth player with point guard skills and another senior by signing Nigel Johnson (11.3 ppg., 35.0% 3pt. ), who was a solid starter in the Big Ten before departing Rutgers as a graduate transfer. Virginia was among the most efficient offenses in the country a year ago, finishing 12th in assist to turnover ratio and 33rd in 3pt%; even without Perrantes, those numbers should remain strong with the ascension of the sophomores. DeAndre Hunter, a top 80 recruit a year ago that redshirted to gain strength in the face of a crowded perimeter, will round out the perimeter rotation. It’s anyone’s guess how much he’ll contribute at the offensive end, but he will provide a high end perimeter defender that, at 6-7, will offer Bennett the sort of length and athleticism Justin Anderson provided three years ago. The biggest change for this Cavaliers team should be the addition of 7-1 redshirt freshman Jay Huff. Originally a top 75 recruit, Huff has added over 30 pounds of muscle to his frame since his senior year of high school, and has the potential to be a longer, more athletic version of Tyler Lydon as a shot blocking stretch four. His range as an interior player should make scoring much easier for Virginia. There will also be senior leadership inside, as Isaiah Wilkins provides just about everything except scoring at both ends of the floor after improving dramatically as a rebounder and finishing second in ACC defensive player of the year voting last season. Wilkins (6.8 ppg., 6.0 rpg.) was really the only consistently productive big man on the team last year, and his absence due to illness in the NCAA Tournament was a huge contributing factor to the final margin of defeat against Florida. Redshirt sophomore Mamadi Diakite should be ready to make more of an impact as well; as an early college entrant, he’s a true sophomore by age, and is still adding strength to the long, athletic 6-9 frame that made him a top 40 recruit out of high school. He finished second only to Wilkins in blocked shots a year ago, and was the team’s best per minute shot blocker by a large margin (1.2 bpg. in 14 mpg. ); rebounding and scoring, both inside and out, seem likely to follow. 6-11 junior Jack Salt proved to be a solid anchor to the team’s pack line defense as the starting center for most of the year, but his actual production was very limited beyond defensive rebounding; he could see his minutes decrease with the development of additional talent around him. There was a bit of a sky is falling reaction to the transfers of Thompson, Shayok, and Reuters by several members of the media, but in reality those departures likely came in anticipation of the team being better, not worse. With four players with point guard skills on the perimeter and plenty of shooting including the possibility of a big man with range, this should be the most dangerous offensive group Tony Bennett has had, and, after finishing 14th in the country in field goal percentage defense and 35th in 3pt.% defense a year ago, the increased athleticism and shot blocking in the frontcourt can only help the team's always imposing pack line defense become even more stifling. Despite last season’s disappointing end, there is reason to believe Virginia is still improving as a program, and the Cavaliers should again be a contender for the ACC title and a threat to make a deep tournament run. December 13 pre-conference update: Virginia has been Virginia, ranking 10th in the country in field goal % defense and 33rd in 3pt.% defense. However, despite showing flashes of brilliance in his few brief chances, Jay Huff isn't a part of the rotation, presumably for defensive reasons. Bennett has instead chosen to stick with Jack Salt and keep two offensively limited post players on the floor at all times, something that clearly didn't work in their loss to West Virginia. If Bennett isn't interested in improving the team's offense, Virginia's glass ceiling is going to remain perfectly visible. February 23 Update: UVA will almost certainly receive a 1 seed in the NCAA Tournament, and could be the top seed overall. The team is playing the pack line defense as well as it has ever been played, and offers more at the offensive end than Brad Stevens' two national runner-up Butler teams. That is thanks in part to the emergence of De'Andre Hunter as a forth scoring option; he could become Bennett's best NBA prospect to date if he continues to improve next season. The low number of possessions that their style of play produces could keep games close and make them vulnerable, but the Cavaliers are a definite NCAA title contender. March 14 Pre-Tournament Update: While the loss of De'Andre Hunter to a broken wrist does seem to end Virginia's National Championship hopes, it doesn't mean they can't still equal or even surpass Tony Bennett's deepest run in the Tournament. The defense will still be imposing, and the team still has four guards capable of scoring from the perimeter and a developing post scorer in Mamadi Diakite. Matchups could still allow the Cavaliers to reach the Final Four or even the Title Game; they would certainly be a threat to beat a defensively challenged Arizona team if they do meet in the Sweet 16. It will be Grayson Allen and a bunch of (very talented) new people at Duke. With a second round loss to South Carolina, Duke was a part of the ACC's NCAA Tournament collapse a year ago, and much of that team was lost to graduation and early entrance to the NBA. However, like Kentucky, Duke doesn't rebuild but reloads, again signing one of the top recruiting classes in the nation. Still, Mike Krzyzewski will be challenged with one the youngest teams he's ever had, as only one likely rotation player will be above a sophomore. Krzyzewski landed what could be his most talented point guard since Kyrie Irving with the signing of Trevon Duval, the most highly rated guard in his class and a projected lottery pick in next year's draft. Duval is the true point guard Duke has been missing since Tyus Jones helped lead the team to a championship in 2015; at 6-3, he's also an explosive athlete, a capable scorer, and an excellent defensive player. By his side, and also serving as his backup at point guard, will be senior Grayson Allen, who had an inconsistent junior year as a result of more bizarre on-court decisions and the resulting media and fan scrutiny. Despite his struggles, Allen (14.5 ppg., 3.7 rpg., 3.5 apg., 36.5% 3pt.) is still a long and extremely athletic player with a high motor and a great jump shot and will still be a likely first round pick after graduation. A second top 10 recruit, 6-6 wing Gary Trent Jr., will complete what should be the best starting perimeter in the country by the end of the year. Trent is one of the best perimeter shooters in his class and has a strong mid-range game as well. Like Duval, he is also a high end defender, insuring that the Blue Devils will again excel at defending the 3 point line (the team finished 4th in the country in 3pt% defense last season) which is particularly important in the ACC. Alex O'Connell, a 6-6 top 70 recruit, will see time at small forward; he offers similar size and a similar skill set to Luke Kennard, although he isn't quite as far along and, perhaps more than Kennard as a freshman, will need to add strength to become effective. The most prominent member of Duke's recruiting class didn't commit until mid August, when Marvin Bagley III decided to reclassify and join the Blue Devils. Bagley's status as the clear number 1 prospect in the class of 2018 has to be taken with a grain of salt due to his early college entrance (although he is already 18), but Duke doesn't really need him to have the impact of Anthony Davis at Kentucky right away (though he does have that kind of potential) to win a national title; they simply need him to replace, and perhaps improve upon, the production provided by Jayson Tatum, Brandon Ingram, and Justice Winslow at power forward over the past few years, and that seems well within reason. Bagley's incredibly athletic at 6-11 and, while still a lean 221 pounds, he may already be stronger than Ingram will ever be; he should at least outperform those players on the boards and at the defensive end, and, while he doesn't have their range at this point, his skill facing the basket should help keep the offense moving and allow him to get his points as well. Bagley's skill and athleticism make him a strong complement to the previous most highly ranked recruit in the class, top 5 center Wendell Carter. At 6-10, 255 pounds, Carter's game bears a strong resemblance to that of Jahlil Okafor; he should dominate as a post scorer and rebounder, although he won't intimidate opponents as a shot blocker. The arrival of Bagley and Carter means that the Blue Devils don't have to be overly concerned if 6-11 sophomore Marques Bolden, a former top 10 recruit that looked lost, ineffective and poorly conditioned as a freshman, doesn't pan out. Krzyzewski also has 7-0, 270 pound junior Antonio Vrankovic available; he was significantly more effective than Bolden (he's an effective, high motor rebounder), although he may not be skilled or mobile enough for big minutes. Physically explosive 6-10 sophomore Javin DeLaurier, a top 50 recruit a year ago, played in just 12 games and produced very little beyond a respectable rebounding rate as a freshman, but he has plenty of upside and could also help off the bench. Between the three, someone should emerge to provide the Blue Devils with respectable depth in the post. Krzyzewski's short rotations have made it difficult for the Blue Devils to remain competitive at the defensive end with foul trouble late in games over the past few years (Duke finished 147th in fg% defense last season), and that problem can only be exacerbated by the team's extreme youth, with the lone senior more likely to need the support of his teammates than they are to need support from him. Still, the starting perimeter of Duval, Allen and Trent should be excellent defensively, Bagley and Carter provide the potential for another dominant rebounding Duke squad similar to the 2015 title team, and the offense will again be one of the best in college basketball thanks to the arrival of a true, elite point guard that will be surrounded by plenty of perimeter shooters and two skilled and physically imposing frontcourt weapons. Duke could experience some growing pains early in their ACC schedule with such a young group and will need to develop some depth along the way, but with three projected top 10 picks, another projected first rounder, and two additional top 10 recruits being coached by a hopefully healthy Mike Krzyzewski, the Blue Devils again appear to have all the pieces necessary to emerge as a national title favorite by March. December 13 pre-conference update: Marvin Bagley (21.3 ppg., 11.3 rpg.) may not have needed to be a star, but he definitely is. Marques Bolden has shown flashes of what he was projected to be (although primarily in games against Portland State and St. Francis), but Javin Delaurier has been the real impact player off the bench, taking in 5.1 rebounds in 13.8 minutes per game (and doing a little bit of everything else as well) off the bench. Between Bagley, Wendell Carter (12.6 ppg., 8.7 rpg. ), and Delaurier, Krzyzewski has one of the best rebounding groups he has ever had (they are currently 3rd in the country in rebounding margin), and with most of the ACC playing small and North Carolina's freshmen big men only marginally productive the Blue Devils should dominate on the boards at both ends of the court in ACC play. Duke is also efficient at the offensive end (7th in assist to turnover ratio) and the freshmen are gradually becoming comfortable behind the arc. The problem, as demonstrated in their loss to Boston College, is in defending the 3 point line (189th in 3pt.% defense), a problem caused in part by Krzyzewski's lack of confidence in his perimeter bench. Bagley played 40 minutes in the BC game, moving to small forward and playing with two big men when the perimeter players went to the bench, which is an obvious recipe for disaster with regards to perimeter defense. Alex O'Connell played the only two full minutes off the bench from a guard; he can shoot and at 6-6 he should be able to at least run people off the 3 point line. Duke is obviously going to be in the national title picture, but O'Connell will have to be trusted to do more if the team is going to be able to avoid an NCAA Tournament upset by the first team that gets hot behind the arc. March 2 update: This will be a very different Duke team heading into the ACC and NCAA Tournaments. The team how somehow shored up its perimeter defense (they are now all the way up to 64th in the country in 3pt% defense after struggling through the first half of the season) by switching to a zone defense, which allows Krzyzewski to keep his starters on the floor even more and simplifies the defense for a team of mostly freshmen and sophomores. With the length and mobility of Bagley, Delaurier, and Carter and a collection of future NBA players, Duke will give the ACC two legitimate NCAA Championship contenders. Clemson will have to have more passing from their guards. Clemson failed to capitalize on Jarron Blossomgame's senior year, ending their season with a first round NIT loss to Oakland. Perhaps worse, the team struggled to defend and rebound (finishing 252nd in FG% defense and 241st in rebounding margin), two areas where Brad Brownell teams can normally be trusted to compete and excel. As a result, Brownell likely finds himself in a position where his team must improve despite the loss of the only NBA potential on his roster if he wishes to stick around for another year. Offensive efficiency wasn't a major issue with last year's Tigers – although the team did drop from 48th to 94th in assist to turnover ratio, and they could take another hit in that area with the departure of Holmes and Blossomgame. On the bright side, transfer Shelton Mitchell eventually claimed the starting point guard spot and began living up to his high school billing. Mitchell averaged 15.9 points on a remarkable 68% behind the arc over the team's last 10 games; unfortunately, he also put up just 2.7 assists per game as the team's point guard during that span. He should be joined by another bomber and former transfer in Marcquise Reed (10.0 ppg., 40.2% 3pt. ), who put up excellent numbers in his first year at Clemson. His minutes were partially limited by the outstanding season Avry Holmes had shooting the basketball, but he should receive all the playing time he can handle now. A lack of ball movement hurt small forward Donte Grantham (7.3 ppg., 4.3 rpg.) more than anyone, as he struggled with his shot all season after a promising sophomore year. Brownell will need him to pull things together as a senior if the Tigers are going to succeed. 6-5 redshirt freshman A.J. Oliver, originally a top 90 recruit in the class of 2017 that reclassified and redshirted last year, should provide instant offense off the bench. He's an aggressive, athletic scorer that should guarantee Brownell has at least two dangerous perimeter shooters on the floor at all times. Senior Gabe Devoe (7.1 ppg.) will return as a contributor off the bench; he does everything relatively well except shoot, which could result in decreased minutes if the team is having trouble scoring. Offense is going to get substantially more difficult without Blossomgame, who could create his own shot and averaged 17.7 points on 49.9% shooting overall as a senior. The only options available to Brownell will be to play a freshman at power forward or to use a smaller lineup with Grantham moving down, but the former will further damage offensive efficiency while the latter will kill the team on the boards. 6-9 junior Elijah Thomas is more skilled offensively than Sidy Djitte, and he will have to emerge as a post scorer if the team is going to have any balance at the offensive end. Unfortunately Thomas (7.5 ppg., 4.2 rpg.) doesn't rebound quite as well as Djitte, which was already an issue, but he is a more capable deterrent at the rim. Two four star freshmen, both of whom need to get stronger but will probably need to play right away, are the most likely candidates to replace Blossomgame. 6-7 Aamir Sims is a long armed, active and athletic rebounder that could eventually contribute more on the boards than Blossomgame, who despite his size and athleticism didn't rebound particularly well. 6-8 Malik William is a capable shot blocker that offers potential as both a perimeter shooter and passer. The starter may be determined by who is able to add the most strength by the time the season starts. Brownell also brought in Mark Donnal as a graduate transfer; while he offers some potential as a perimeter shooter, he didn't rebound his position very well at Michigan, but he may serve as the backup center by default. This is not a good time for Brownell to have to replace an NBA prospect at power forward with two underweight freshmen, but that is where the Tigers are right now. There is at least historical reason to believe the team will improve at the defensive end, but rebounding is likely to be an issue once again, and there is a very real possibility that the offense will devolve into the stagnant mess it was before Blossomgame's breakthrough junior year (that 2014-2015 team finished 285th in overall fg% and 245th in assist to turnover ratio). If the freshmen are all surprisingly good right away, this could still be a thoroughly respectable Clemson team, but the more likely scenario is that the Tigers will have a new coach next season. December 19 pre-conference update: The Tigers performed well in their non-conference schedule, although their only wins against ACC caliber competition were an impressive road victory over Ohio State in the ACC/Big 10 Challenge and a neutral court win over a Florida team whose wheels have temporarily fallen off. The team doesn't defend the 3 well (243rd in 3pt.% defense), and while the offense has performed adequately to this point it will be interesting to see how it holds up against ACC competition. Clemson may, like Syracuse, serve as a resume builder for other ACC teams with its strong non-conference numbers. 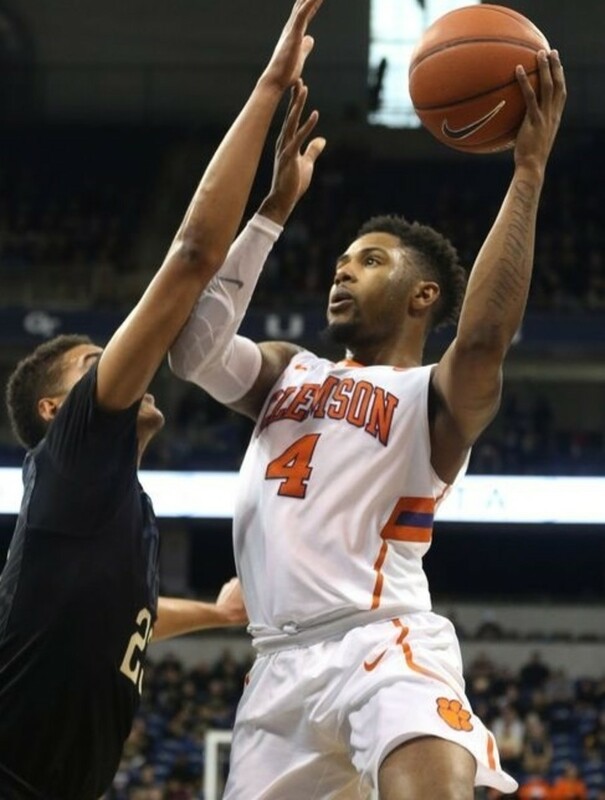 Jan. 16 Update: Clemson's 4-1 start in the ACC means that an in conference meltdown like the team suffered a year ago would have to be severe to keep them out of the NCAA Tournament. The Tigers are again playing strong defense (37th in fg% defense) after an off year last season, and they have improved their efforts to defend the 3pt. line (now up to 139th in 3pt.% defense) since struggling earlier in the year. While there is no one scorer replacing Blossomgame's contributions, the team has a balanced scoring attack with five players averaging double figures. Marcquise Reed (15.9 ppg., 4.7 rpg., 3.0 apg. 41.3% 3pt. ), Donte Grantham (14.9 ppg., 7.4 rpg. 42.6% 3pt. ), and Gabe DeVoe (11.5 ppg., 4.7 rpg., 36.8% 3pt.) are all having their best years as seniors, and while Shelton Mitchell's shooting has fallen off from the end of last season he has been more helpful as a distributor and is posting a better than 2 to 1 assist to turnover ratio. Although the team's current gaudy record (15-2 overall, 4-1 in the ACC) still seems destined to come back to earth, Clemson is well on course for a return to the NCAA Tournament in an effort that would allow Brad Brownell to keep a job that was very much at risk prior to the season. Jan. 21 Update: The loss of Donte Grantham is a huge blow to Clemson at both ends of the floor. It eliminates the offensive balance the team has had with all five starters averaging double figures (again, Brownell's teams have struggled with offensive efficiency historically), and the Tigers don't have a way to replace his rebounding. His minutes will go to either freshman Aamir Simms, who has played sparingly to this point, or transfer David Skara, neither of whom can match Grantham's production at this point (although Simms does have long term potential). Clemson was well on its way to an NCAA Tournament appearance prior to the injury, but the committee will consider the team's performance without Grantham heavily. Holding on to a berth will be a difficult proposition, and with the team missing out on Zion Williamson Brad Brownell's future could again come into question. Jan. 30 Update: After a win against a struggling North Carolina team and will several games against weaker teams down the stretch, it will be almost impossible for Clemson to be kept out of the NCAA Tournament at this point. There is still a very real possibility that the team will come back to earth down the stretch and they won't be a major threat once there, but an NCAA Tournament appearance is a major accomplishment for most programs. March 12 Pre-Tournament Update: Clemson drew one of the tougher small conference teams in New Mexico St., whose regular season included wins against Miami (with Bruce Brown) and Illinois. The Aggies play suffocating defense and dominate the boards (5th in fg% defense, 9th in 3pt.% defense, and 5th in rebounding margin). 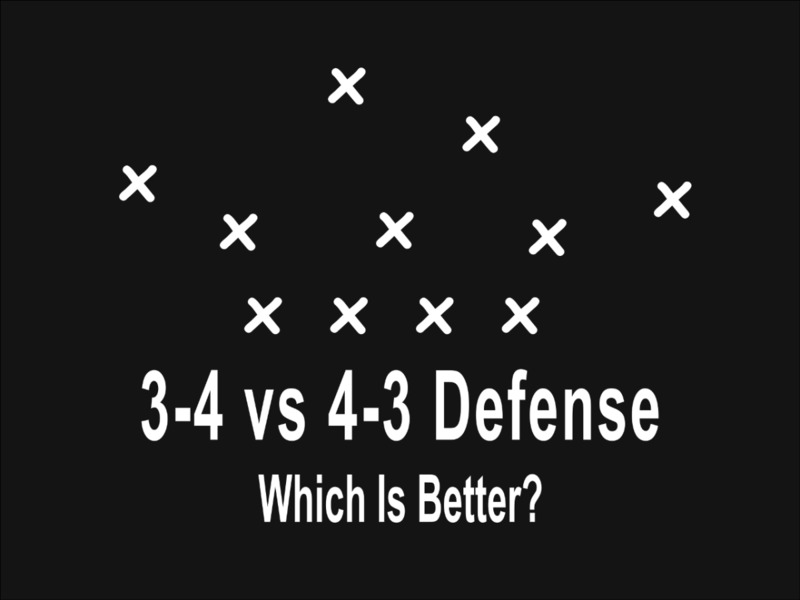 Fortunately, they don't score very well themselves, so a tough Clemson team will simply have to find more ways to score than New Mexico St., who are heavily dependent on the scoring of one player. Sophomore Bruce Brown could be the elder statesman of Miami's starting perimeter. Last year's Miami Hurricanes struggled to score without a true point guard following the graduation of seniors Angel Rodriguez and Sheldon McClellan, but Jim Larranaga's squad was still able to garner an 8 seed in the NCAA Tournament through the strength of their rebounding and defense. That issue may have been addressed as the talent level at Miami continues to increase under Larranaga. Miami's perimeter will be made up primarily of freshmen and sophomores, but it will feature two players currently projected as first round picks in next year's draft. Bruce Brown (11.8 ppg., 5.6 rpg., 3.2 apg., 34.7% 3pt.) emerged as a team leader as a freshman, eventually taking over and performing admirably at point guard despite playing out of position. He should score more easily playing off the ball. Joining Brown will be Lonnie Walker, who as a top 15 recruit is the most highly regarded prospect Larranaga has ever signed. Walker is an aggressive scorer that should complement Brown well. At 6-4, he will likely end up spending significant time at small forward, but with his NBA caliber athleticism, long arms, and strong frame, that shouldn't be a problem. Brown will be able to spend much of the game off the ball due to the arrival of Chris Lykes, a top 50 recruit that should be the true point guard Miami sorely lacked a year ago. At 5-7, Lykes will have to settle for being pesky rather than imposing at the defensive end, but he's an excellent athlete that excels at breaking down a defense off the dribble, and he's also a strong perimeter shooter with a dangerous floater. Miami struggled with offensive efficiency last season without a true point guard, finishing 253rd in assist to turnover ratio, but with the arrival of Lykes that problem should be eliminated. The Hurricanes also return Australian Dejan Vasiljevic (6.0 ppg., 34.9% 3pt. ), who established himself as a dangerous perimeter shooter as a freshman. Having more talented players around him and increased ball movement should make it easier for him to find open looks. Ja'Quan Newton (13.5 ppg. ), who began last season as the starting point guard, likely won't be asked to fill that role again after ending the season with a nearly 1 to 1 assist to turnover ratio. Newton excels at creating shots for himself inside the arc, but he could see his playing time diminish as the team looks to become more efficient at the offensive end. Larranaga will have high end talent available in the frontcourt as well. Dewan Huell, a top 25 recruit a year ago, performed well during the nonconference schedule but wasn't physically ready to compete inside in the ACC. With a year in the weight room, he should prove to be a more skilled and athletic version of the departed Kamari Murphy with a breakthrough sophomore year. Joining him may be junior Anthony Lawrence (6.8 ppg., 35.4% 3pt. ), who does a little bit of everything for the Hurricanes. Lawrence may also see time at small forward, but he's the type of skilled stretch 4 that Larranaga prefers. The other starting option will be 6-10 junior Ebuka Izundu, an athletic, high motor center developing slowly in the Tonye Jekiri mold. Sam Waardenburg, a redshirt freshman from New Zealand that was a 4 star recruit a year ago, is still a very lean 6-9 but could see time as a stretch 4. While Murphy and Reed were important to Miami's success at the defensive end (the team finished 74th in fg% defense, 71st in 3pt% defense, and 56th in rebounding), there is every reason to believe that their successors will excel in that area as well. However, this will be a very different team at the offensive end, and that should be a positive development. This Hurricanes team should score, and eventually even score easily. While the team will be very young, Miami will have the talent to match anyone in the ACC, and they have an excellent teacher that should have them ready to make a serious run by March. December 14 pre-conference update: Miami is very much as advertised to this point in the season. Ja'Quan Newton remains the starting shooting guard for the time being, but with both Lonnie Walker (9.9 ppg., 41.9% 3pt.) and Chris Lykes (7.1 ppg., 43.3% 3pt.) showing the all around scoring potential that made them highly regarded recruits that seems likely to change at some point, although Lykes may not recieve many chances at point guard this year. The Hurricanes are finding perimeter shots much more easily with the additional floor spacing, with Dejan Vasiljevic perhaps benefitting the most (11.8 ppg., 42.0% 3pt.). The teams currently ranks 36th in the country in 3pt. %, and the offensive improvement should help them find even more success in conference play. January 30 update: The Hurricanes will likely see their offensive efficiency plummet without Bruce Brown for the next six weeks, but with the exception of their matchup with UVA they will be facing a series of flawed teams down the stretch in the ACC and should still be able to reach the NCAA Tournament. Miami plays excellent defense (26th in overall fg% defense and 22nd 3pt.% defense), and Lonnie Walker, Chris Lykes and Ja'Quan Newton are all capable of creating their own shots. Although their seeding will likely suffer, if Brown is able to return by Tournament time the Hurricanes will still be dangerous. 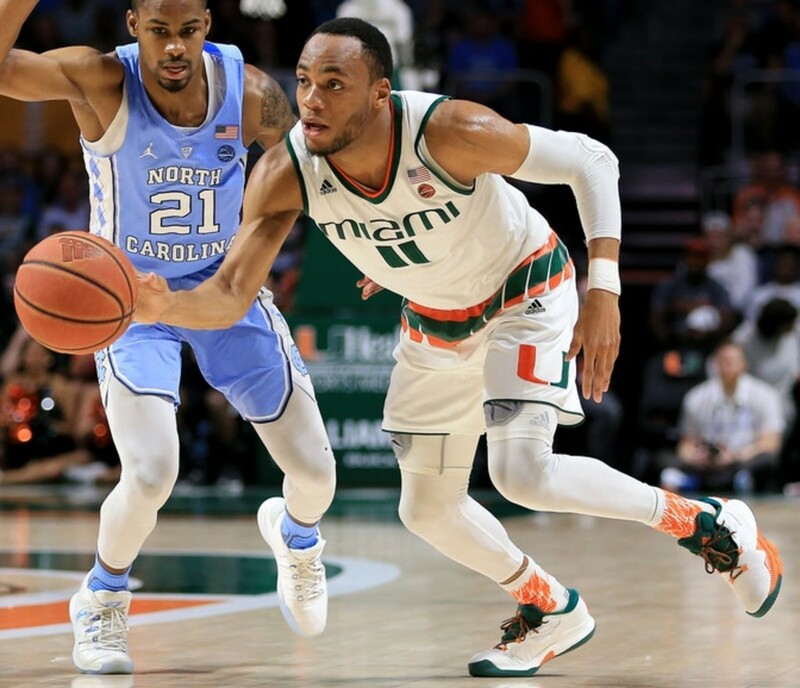 March 12 Pre-Tournament Update: It now appears that Bruce Brown will not return for the NCAA Tournament, which means that the Hurricanes will continue to be limited offensively. Miami is vulnerable to a strong Loyola-Chicago team, but fortunately the Ramblers don't really pressure the basketball so Miami may be able to generate enough points to break through to the second round by means of their defense and size advantage inside. Joel Berry will see a lot of new people in the huddle as a senior. Last season, North Carolina overcame the loss of two of their top three players and returned to the national title game to avenge their heartbreaking loss to Villanova with a National Championship. The team loses a lot more than that this year, with three starters and two key reserves departing and predominately freshmen and sophomores available to take their place. Bradley's decision to stay in the draft is particularly painful, and will leave the Tar Heels to find a different approach at the offensive end. Even with all of the departed talent, the Tar Heels will continue to be a tough matchup with senior Joel Berry at point guard. Berry (14.7 ppg., 3.6 apg., 38.3% 3pt.) was the clear leader of North Carolina's championship run, and with him the Tar Heels will at the very least remain efficient at the offensive end (the team finished last season 7th in assist to turnover ratio) and know where to turn in the clutch. Top 30 recruit Jalek Felton, a smooth passing, long and athletic 6-4 point guard with a dangerous jump shot, could move into Jackson's spot. He can't be expected to provide what Jackson did last season as a freshman, but he can be a solid complement to Berry. Felton can get lost at times, so a year off the ball with Berry should be beneficial. 6-8 graduate transfer Cameron Johnson will also be joining North Carolina after a strong year shooting the basketball at Pitt (11.9 ppg., 4.5 rpg., 41.5% 3pt. ); he'll help replace Justin Jackson as a perimeter threat, which the Tar Heels will need as much of as they can get with no post scorer available. Theo Pinson (6.1 ppg., 4.6 rpg., 3.7 apg.) returns for his senior year at small forward, where he does everything well except shoot the basketball. Even if he never finds his stroke, his passing, rebounding, and defense will be even more important if the Tar Heels have trouble scoring; this would be the perfect time for him to finally remain healthy. Roy Williams will have three question marks with potential available to fill out his perimeter rotation. Kenny Williams showed promise as a 3 and D guard starting beside Berry to begin last season (he was 13-26 from three over the first 9 games), but a shooting slump and eventual knee injury derailed his season; Brandon Robinson was far too light to make much of an impact as a freshman, but he could also be an excellent perimeter shooter and defender with more strength; and Seventh Woods is an outstanding athlete that played in every game, but there just isn't much for a 6-2 non-point guard that can't shoot to do at the offensive end. All three were top 100 recruits a year ago, and there's little doubt what any of them will be doing with their summer vacations. After bursting onto the national scene with a late game winning jumper against Kentucky, 6-8 junior Luke Maye finds himself as the only returning contributor to the North Carolina frontcourt; he will now move into Isaiah Hicks' spot at power forward. Maye (5.5 ppg., 3.9 rpg., 40.0% 3pt.) won't be able to create his own shot like Hicks, but he provides Roy Williams with a skilled and accurate stretch four, and he's a better rebounder than Hicks at both ends of the floor. His perimeter shooting becomes particularly important without a post scorer because of the need to spread the floor and create more movement. The majority of the remaining frontcourt minutes will go to a pair of bullish 4 star freshmen in 6-9 Garrison Brooks and 6-10 Brandon Huffman. While neither is likely to be ready to replace Meeks as a post scorer, both offer similar size and athleticism to Meeks and should be ready to contribute on the boards right away, with Brooks particularly excelling on the offensive glass. With the three primary big men subject to foul trouble (Maye can collect fouls in a hurry at times, and Brooks and Huffman are freshmen), 6-10 Sterling Manley, a 3 star center, will likely be forced into action as well. Rebounding should certainly fall off from last season when the Tar Heels led the nation in rebounding margin, but Maye, Brooks, Huffman, and Theo Pinson should still make it a strength, and North Carolina should still win on the boards most nights. This will be a very different North Carolina team with regards to personnel, but some of the things that make the Tar Heels great aren't going to change. This team should still excel defensively (the Tar Heels were 47th in fg% defense last year), pressuring the basketball (66th in steals) and bothering people with their length on the perimeter and pushing people around inside, and the offense should remain efficient despite being forced to a more perimeter oriented attack. Still, this won't be a top 10 offense or the number 1 rebounding team while replacing Jackson, Meeks, and Bradley with freshmen, so the expectations can't be quite as high. While a third consecutive National Championship Game is unlikely, Roy Williams still has far too much talent, and far too much senior leadership in Berry and Pinson, for this to be considered a rebuilding year, and North Carolina should again take their place among the blue bloods in March. December 14 pre-conference update: Luke Maye has ascended to star status for the Tar Heels, posting 19.9 points and a truly impressive 10.5 rebounds per game while shooting 48.1% from behind the arc. He's also excelled at staying out of foul trouble, finishing with more than two fouls in just two games. That's particularly important as the freshmen big men provide little offensively, although the Garrison Brooks-Sterling Manley center combo has been successful defensive and on the boards. UNC still ranks 2nd in the country in rebounding margin; with so much of the conference using smaller lineups they will still have an advantage against almost everyone (with the likely exception of Duke) in ACC play. Jalek Felton is coming along slowly as the backup point guard, but with Theo Pinson (stuffing the stat sheet with 9.4 ppg., 5.1 rpg. And 4.4 apg.) helping facilitate the offense it remains extremely efficient. The eagerly anticipated return of Cameron Johnson from a knee injury will give the team a much needed additional perimeter scoring threat for conference play; with Maye, Joel Berry and a healthy Kenny Williams (13.4 ppg., 55.0% 3pt.) already off to strong starts in that area (UNC is already 42nd in 3pt%), UNC's offense is still quite potent and may feature the best perimeter shooting the school has ever had (although without a post scorer they may be a live by the three, die by the three team at times); however, as much as Duke has struggled to defend the 3, UNC has been worse, currently ranking 303rd in Division 1 in 3pt.% defense. The Tar Heels will again be a contender in the ACC, but they have their vulnerabilities as well. Feb. 23 Update: The Tar Heels have taken off of late after adding Cameron Johnson, moving Luke Maye to center for more favorable offensive matchups, and playing their starting five significantly more than they normally would. Perimeter depth (there is no real backup point guard with Jalek Felton's offcourt issues) could become an issue, but the freshmen center duo plays well enough that the team can play bigger if needed and Theo Pinson can help facilitate offense if Berry gets into foul trouble. The biggest difference from last year's Championship team is a lack of offensive diversity without a true post scorer and players that create their own shot (something Jackson and Hicks could do last year), but UNC starts five players that can bomb the 3 and, despite starting small with Maye at center, still lead the country in in rebounding margin. North Carolina is North Carolina, and they will again be a threat for a deep run in March, although they aren't really the title contender they have been the past few years. Torin Dorn should see the ball more often as a junior. Last year’s NC State team underachieved horribly with a tremendous amount of talent to the point that the administration felt justified in announcing the termination of the relatively successful Mark Gottfried (four NCAA tournament appearances, including two Sweet 16s, and an injury marred 2015-2016 season in his first 5 years) at midseason. While the Wolfpack was unable to land one of the established big name coaches the fan base and administration originally targeted, they did manage to convince one of the best up and coming coaches in the country to come to town, an impressive feat considering the treatment of Gottfried. Kevin Keatts took UNCW to NCAA Tournament appearances each of the last two seasons while also winning the CAA coach of the year award twice in his three years there. He's a former Rick Pitino assistant that likes to play up-tempo and excels in developing offensive efficiency, something that was sorely lacking from last year’s Wolfpack. Keatts steps into a situation with a still very talented roster and potentially unrealistic expectations of the program by the fan base. As good as Dennis Smith Jr. was, he sometimes dominated the basketball to the point that his teammates stood around and watched. That won't be an issue this year. Keatts' first point guards with the Wolfpack will be young but talented and predominately pass first. The likely starter will be sophomore Markell Johnson, a top 70 recruit despite being an early entrant last year. While he didn’t look for his shot very often as a freshman with Smith and plenty of established shooters around him to distribute the ball to, Johnson was one of the few members of the team that seemed to actually care about defense, and he took care of the basketball with a better than 2 to 1 assist to turnover ratio. He should be one of the most improved players on the team. Two freshmen, Lavar Batts and Braxton Beverly, will backup Johnson. Batts, a top 100 recruit, is a similar player to Johnson that excels at getting to the basket, although he may need to add strength to do so in the ACC. Beverly is finally eligible after a bizarre NCAA decision was overturned following a barrage of negative publicity. He's a four star prospect that's smart with the basketball and put up a lot of points in high school; his perimeter shooting will be particularly welcome in Keatts' offense. While the point guards will be young, they will be flanked by high end, experienced shooters and scorers starting on the wings. 6-6 junior Torin Dorn carried the team at times in the non-conference, averaging 14.9 points on a torrid 55.8% shooting overall and 45.7% shooting behind the arc to go along with an impressive 6.5 rebounds during the team's 11-2 start; there were many reasons why the wheels fell off for the team once conference play began, and his decreased opportunities was among them. Dorn should benefit from Smith's departure as much as anyone. Keatts filled out his starting perimeter by adding graduate transfer Al Freeman, an athletic 6-4 guard that averaged 9.4 points on 38.9% shooting behind the arc at Baylor last year; he should adequately replace Henderson at shooting guard. Graduate transfer Sam Hunt will likely see time for the Wolfpack as well; he led NC A&T in scoring each of the last two years, but at 6-2 he posted modest shooting percentages and more turnovers than assists while playing in the Mid-Eastern Athletic Conference. 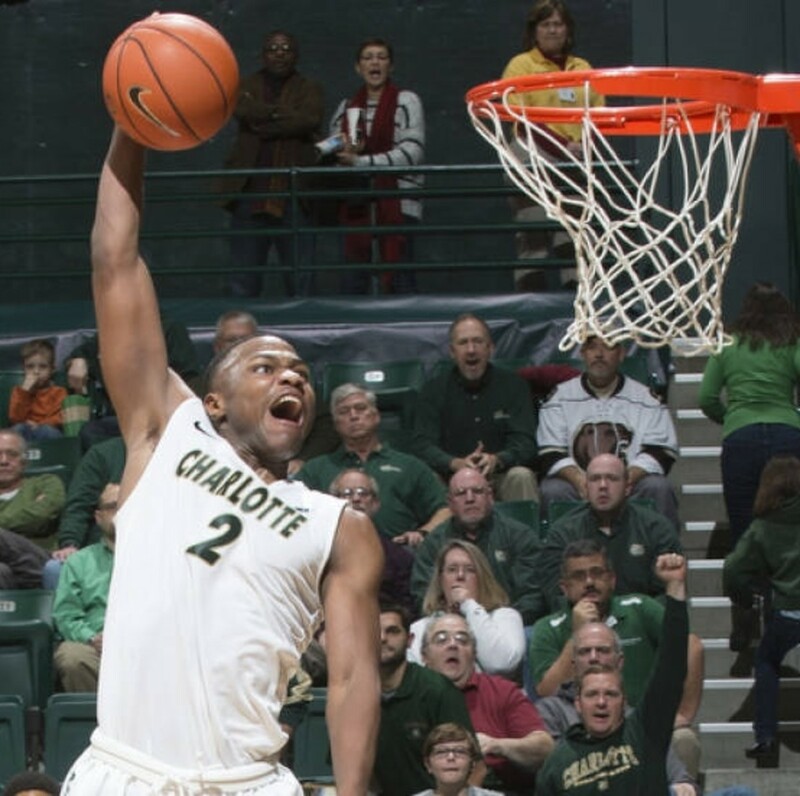 The UNCW team Keatts took to the NCAA Tournament last season finished 4th in the country in assist to turnover ratio; while it will be hard to repeat those numbers in the ACC with three young point guards, the Wolfpack should improve significantly in that area over last season, when they ranked 147th despite having a lottery pick at point guard. The biggest weakness of Keatts’ final UNCW team was at the defensive end, where the Seahawks finished 333rd in field goal percentage defense – actually worse than the Wolfpack, who finished 237th. However, that was at least partly due to the fact that UNCW was one of the smaller teams in Division I, with only their 6-7 centers measuring over 6-5. No such problems will exist with the Wolfpack, who are relatively loaded with size in the frontcourt and athleticism everywhere. 6-8 senior Abdul-Malik Abu will again be the key figure in the post. Abu's play leveled off in last year's disorganized mess (11.8 ppg., 7.0 rpg. ), and he ended up developing a penchant for staying in foul trouble. He's an explosive athlete capable of more, and should benefit from the change at point guard. Also returning after considering the draft is 7-0 sophomore Omer Yurtseven, who flashed potential last season but was ultimately part of the team's disappointment. He's another player that didn't really get many opportunities with the Smith show, and when he did he wasn't really strong or confident enough to be affective. Yurtseven's agile, mobile, and offensively skilled both inside and out, and with added strength and a more defined roll he'll be a perfect fit for what Keatts wants to do offensively and might even live up to his original billing. Senior Lennard Freeman (5.0 rpg. in 19.4 mpg. on an injured leg two years ago), a physical bully in the post that missed last season with a lingering leg injury, will provide toughness and heart that was missing from the Wolfpack defense last season. Keatts has grown accustomed to smaller lineups, so there is a very real possibility he will use Dorn as an undersized 4 at times, particularly when Yurtseven is off the floor. Again, there were many reasons for the Wolfpack's failure a year ago, but the biggest one was that in some ways the team just stopped trying. While he won't have as much talent available as Gottfried did, Kevin Keatts should reinvigorate everyone, first and foremost by reorganizing everything the team does at both ends of the floor. He likes to pressure the basketball and he will definitely have the athletes available to do so, while the offense stands to become more efficient. If he's successful and the team adjusts to his style quickly, the Wolfpack could still challenge for a spot in the NCAA Tournament in his first season. If that doesn't happen soon, things could get ugly once again in Raleigh. December 19 pre-conference update: The Wolfpack wasn't particularly impressive in non-conference play, but they didn't hurt themselves too much either despite Abdul-Malik Abu's knee injury, Braxton Beverly's eligibility issues, and Markell Johnson's suspension. After a slow start, Beverly has taken off and taken over at point guard in Johnson's absence, averaging 12 points and 4.6 assists per game and shooting 38.9% behind the arc over his last 7 games. When Johnson, who was having a great year (8.7 ppg., 6.6 apg., 2.4 spg., 39.1% 3pt.) prior to his suspension, returns, Keatts will have a dangerous and efficient duo that should be able to compete in the ACC. Omer Yurtseven (11.8 ppg., 6.3 rpg., 1.6 bpg.) has started to show the potential that made him a projected first round pick prior to his freshman year; with Abu continuing to get healthier and Lennard Freeman (12.6 ppg., 5.3 rpg., 1.2 bpg.) having a career year, NC State should have all the pieces in place to make a return to the NCAA Tournament. March 2 Update: Despite a disappointing loss to Georgia Tech, NC State will enter the ACC and NCAA Tournaments with what should be a great deal of confidence. They take care of the basketball (47th in assist to turnover ratio), generate pressure (37th in steals per game), and defend the 3 point line extremely well (19th in 3pt.% defense), which is a huge asset with the way the game is being played. Despite their young backcourt, the Wolfpack will be a threat to win a game or two in the Big Dance. March 12 Pre-Tournament Update: NC State drew a tough matchup in Seton Hall, who takes care of the ball well enough to stand up to the Wolfpack's pressure, doesn't really rely on the 3pt. shot, and should dominate the boards. The Wolfpack will certainly have a chance, but they will have to outscore Seton Hall to do so (the Pirates are an average defensive team). Chris Clarke has to stay healthy for Virginia Tech to compete at the defensive end and on the boards. Although, like most of the ACC, Virginia Tech's year ended with a disappointing early exit from the NCAA Tournament, the season was a success overall and represented a major step forward for the program under Buzz Williams. The Hokies have improved significantly each of his three years with the school, and the Tournament appearance was the first for the program in a decade. An offseason filled with unexpected attrition will leave the team extremely vulnerable in the paint, but a strong collection of wing players should allow Virginia Tech to remain competitive. While Seth Allen had an excellent senior year, junior Justin Robinson (10.4 ppg., 4.8 apg., 35.8% 3pt.) is the heart of the Hokies offense, aggressively attacking off the dribble and setting up teammates while also shooting well and providing energy at the defensive end. His new backup, top 80 recruit Wabissa Bede, will bring a similar mentality and skill set off the bench. The Hokies also return sharpshooting 6-5 wings Ahmed Hill and Justin Bibbs. Hill (11.3 ppg., 37.3% 3pt.) had a strong return from a knee injury; he's a high energy, athletic player that can probably do more at the defensive end. Bibbs (9.2 ppg., 43.2% 3pt.) has been one of the best perimeter shooters in the conference over the past two seasons. The most highly regarded new arrival for Virginia Tech is 6-5 combo guard Nickeil Alexander Walker, who as a top 20 recruit is the first 5 star prospect Williams has signed at Virginia Tech. He'll provide another dangerous perimeter threat, and his passing ability should help the team maintain its offensive efficiency. With all of the personnel losses, redshirt senior Devin Wilson will likely see time as well; he isn't much of an offensive threat, but he's an experienced point guard that takes care of the basketball and, as a 6-4 former member of the Hokies football team, he provides another capable body at the defensive end. Virginia Tech wins games largely at the offensive end of the floor, and they finished last season as one of the most efficient offenses in the country (the Hokies ranked 11th in overall fg%, 10th in 3pt%, and 54th in assist to turnover ratio); with talented freshmen that should provide more of the same, that success will continue, although losing Outlaw's minutes as a stretch four will hurt. While junior Chris Clarke (11.4 ppg., 7.3 rpg., 3.3 apg.) isn't the perimeter threat that Outlaw is, he's incredibly important to the team's success as its best defender and rebounder and second best returning passer. At just 6-6, 210 pounds Clarke's tremendously helpful at facilitating the offense and he allows the team to remain somewhat competitive on the boards (the team dropped from 236th to 271st in rebounding margin just within the 9 games he missed, and Wisconsin destroyed the Hokies on the boards in the Tournament loss) despite only playing with one true big man throughout the game. He has missed significant time due to injury in both of his years with the program, and his health will be a key factor for the team's success. Unfortunately, the Hokies will face a major size disadvantage in the post. 6-10 Kerry Blackshear missed last season with a medical redshirt after a promising freshman year (6.2 ppg., 4.5 rpg. ); he will return as the Hokies lone hope to compete against big men in the paint, but he doesn't offer the same defensive potential as his former teammates. With the late departure of Sy, Blackshear and 6-10 Belmont Abbey transfer Nick Fullard will be Virginia Tech's only scholarship players over 6-6, and even with the losses Fullard is unlikely to contribute. While the Hokies may be able to compete on the offensive glass with their collection of athletic wings, defending the post, protecting the rim, and closing out possessions defensively are going to be major challenges. Virginia Tech will again be a strong offensive team, and they will again use smaller lineups that leave them vulnerable defensively (the Hokies finished 206th in fg% defense) to achieve it. With Sy's departure, that vulnerability will become exaggerated and, at times, virtually impossible to overcome. Buzz Williams should soon take Virginia Tech to the first Sweet 16 in school history, but late summer personnel losses will almost certainly postpone that appearance one more year. 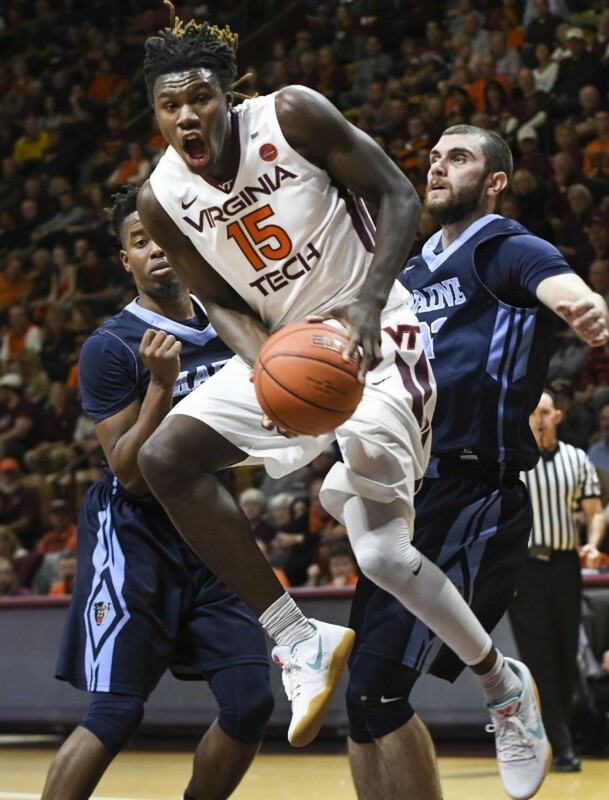 Feb. 23 update: Despite using a 6-5, 215 pound player to defend opposing centers for 15 minutes a game, Virginia Tech has closed strong and will likely reach the NCAA Tournament once more. The Hokies are essentially winning games by shooting the lights out (8th in the NCAA in overall fg% and 22nd in 3pt%), so they will be extremely vulnerable to an off shooting night if they get there. March 12 Pre-Tournament Update: Virginia Tech will face a contrast in styles against an Alabama team that wins games at the defensive end of the floor, but the Crimson Tide plays horrible offense and the Hokies have so many people than can score that they should be able to reach the second round. 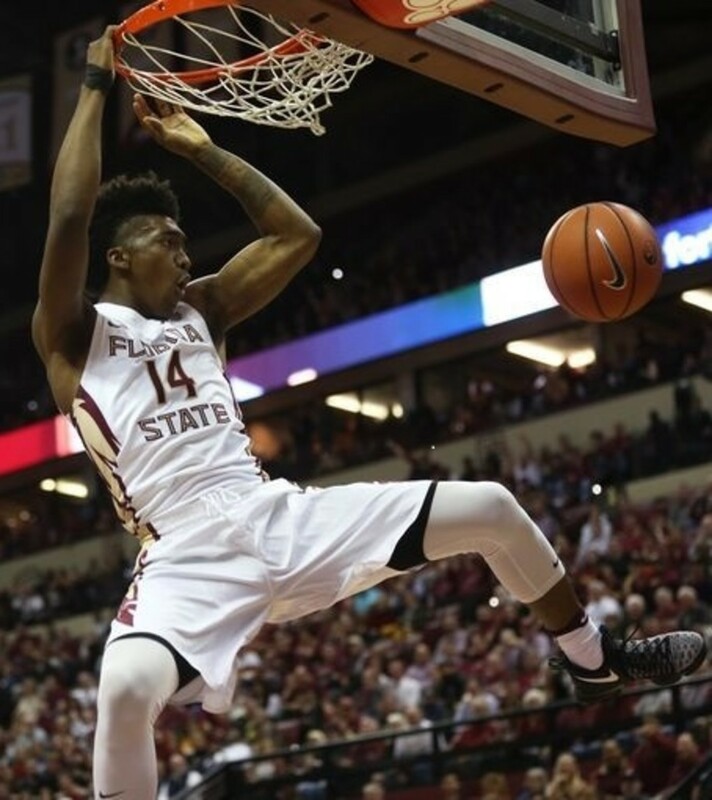 Terance Mann has taken on the role as the best player for the Seminoles. Led by two offensively gifted NBA prospects, Florida State finished last year 2nd in the ACC and reached the NCAA Tournament for the first time since the 2011-2012 season. Those players will be missed, but some of the positive developments at the offensive end should continue to help the team moving forward. Due to an offense that lacks movement and structure and can easily become stagnant, offensive efficiency is routinely an issue for Leonard Hamilton's Seminoles. Scoring is normally dependent on players creating their own shots; however, last year's team proved that Florida St. can still be reasonably efficient with the right personnel by finishing 63rd in assist to turnover ratio (up from 303rd as recently as three years ago). Part of that increase in efficiency was due to improved point guard play. The team has been lead by scoring minded combo guards at times in the past, but Xavier Rathan-Mayes eventually developed a mindset to create for his teammates, and Hamilton brought in two highly regarded, traditional point guards last year in Trent Forrest and CJ Walker. Rathan-Mayes has moved on, but Forrest and Walker should be ready to take on larger roles as sophomores after being reasonably efficient with the basketball as freshmen. Having dangerous, NBA caliber shooters and scorers that can create for themselves is also a plus, and Dwayne Bacon's contributions in that area should be quickly and seamlessly replaced by top 30 recruit M.J. Walker. Walker is a strong and physically explosive 6-4, and is capable of scoring at all three levels. 6-6 senior Braian Angola-Rodas (42% 3pt., 2.4 to 1 assist to turnover ratio) put up impressive shooting numbers and helped take care of the basketball in limited minutes as a junior college transfer and should be in line for increased playing time, while fans would certainly like to see more of junior PJ Savoy, who hit 40% of his 100 3pt. attempts in just 228 minutes (that's a rate of 5.3 makes per 30 minutes of game time). Terance Mann (8.4 ppg., 4.5 rpg.) is the team's leading returning scorer at small forward; while he isn't a great perimeter shooter, he's a strong defensive player and doesn't hurt the team at the offensive end. The player that won't be easily replaced is Jonathan Isaac, and his departure will be a blow to the team's offensive efficiency. His efforts at the defensive end, however, should be more than adequately replaced. For the first time since Bernard James was drafted, the Seminoles will have a dominant shot blocker at center in 7-1 Ikey Obiagu. A top 50 recruit, he should be ready to contribute defensively and on the boards right away. At one time post players like Obiagu were a given for Florida State, and his rim protection could allow the team to return to an elite level at the defensive end (they were still a thoroughly respectable 61st in fg% defense and 18th in blocked shots a year ago). Bouncy 7-4 junior Christ Koumadje is still a work in progress, but he will at least allow the team to have strong rim protection when Obiagu isn't on the floor. Redshirt freshman Mfiondu Kabengele, who at 6-9 has been developing as a stretch 4, will also receive opportunities in Hamilton's extended rotation. Leonard Hamilton uses a maddeningly long bench at times, but he does have plenty of talent at his disposal for that to be effective, and it obviously helps the team retain it's defensive intensity. Although the departure of Rathan-Mayes and Jonathan Isaac will have some impact, this team also has the makings of another moderately efficient offense. The ACC is again loaded with talented, NCAA caliber teams, and Florida State should be among them; the defense will be excellent, and, depending on how well the offense holds together, they could make a return engagement to the NCAA Tournament in March. December 19 pre-conference update: Despite the losses of Isaac, Bacon, and Mayes, FSU has largely been able to pick up where they left off last season offensively, ranking 37th in overall fg% and a solid for the program 114th in assist to turnover ratio. Phil Cofer (13.8 ppg., 5.6 rpg., 48.0% 3pt.) has seeming come out of nowhere to replace Isaac's shooting as a senior stretch 4, while CJ Walker (10.2 ppg., 3 apg., 37.0% 3pt. ), Braian Angola (11.9 ppg., 4.3 rpg., 3.5 apg., 40.7% 3pt. ), and Terance Mann (16.1 ppg., 6.4 rpg., 3.1 apg.) 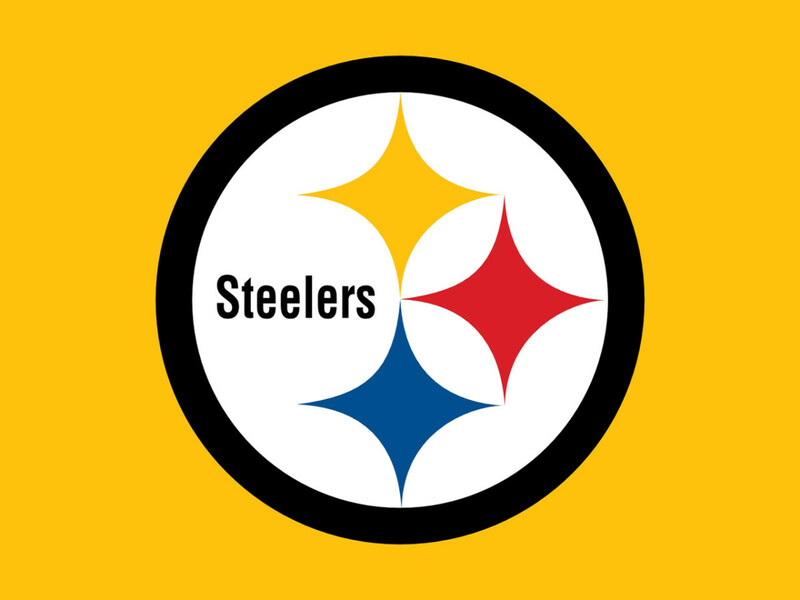 have excelled in expanded roles to help the offense remain reasonably efficient. The defense is as good as it has been in years (15th in fg% defense, 22nd in 3pt% defense), with Ike Obiagu living up to his reputation as a shotblocker. Once Christ Koumadje returns, the Seminoles will have high end rim protection on the floor at all times, with the pair combining for a total of 6.3 blocks per game. Florida State will have a chance in every ACC game it plays, and should again be a threat to win a game or two in the NCAA Tournament. March 12 Pre-Tournament Update: The Seminoles don't match up well against Missouri, with the Tigers likely able to take advantage of Florida State's inability to defend the 3pt. line (240th in 3pt. % defense) and dominate Florida State on the boards. The Seminoles could, however, push through to the second round if they generate enough turnovers against a team without a real point guard that struggles to take care of the basketball. The lanes should be open a little wider for Quentin Snider as a senior. Louisville entered the NCAA Tournament with a well deserved 2 seed, but found themselves matched up with one of the few teams that could match the length and athleticism of their frontcourt and pull those big men away from the basket at the defensive end. The Cardinals lost their most important player from that team to the NBA Draft, and will have to replace half of their frontcourt rotation as well; however, another strong recruiting class and an improving returning cast will again make them one of the most talented teams in the ACC. Off the court, the results of an FBI probe in September leaves 32 year old David Padgett, a former player and three year assistant under Rick Pitino, with the enviable position of taking over a talented roster and the difficult position of taking over for a Hall of Fame coach on an interim basis for a program likely to face a long probation and postseason ban. While Mitchell was clearly Louiville's best player at both ends of the floor, Quentin Snider (12.4 ppg., 4.1 apg., 37.3% 3pt.) continued to progress during a strong junior year, posting a nearly 3 to 1 assist to turnover ratio and shooting well behind the arc. Despite his struggles in the loss to Michigan, the offense will be in secure hands during his senior year. For the first time since taking over as a sophomore, Snider will have a strong backup at point guard in freshman Darius Perry. A top 60 recruit, Perry is quick and aggressive at both ends of the floor and should help replace Mitchell's 2.1 steals per game, although his jump shot is a work in progress. Junior Deng Adel will take Mitchell's place at shooting guard. Adel (12.1 ppg., 4.5 rpg., 34.6% 3pt.) is a solid spot up shooter and at 6-7 will provide imposing length at the position; however, he doesn't have Mitchell's ability to create his own shot or to serve as a secondary ball handler. Mitchell's departure will force the team to play differently, but personnel changes in other areas could make that palatable. Sophomore V.J. King (5.5 ppg., 42.1% 3pt.) will move into the starting small forward spot. Even though he only played 13.5 minutes a game as a freshman, King's currently projected as a first round draft pick in next year's draft. He shot well from three when given the chance last season, and should display more ability to create than Adel given the opportunity. Rick Pitino also made a surprise late addition by signing top 20 recruit Brian Bowen, but questions about his recruitment are at the heart of the FBI investigation. That could create more opportunity for Dwayne Sutton, who averaged 12 points and 7.7 rebounds and was first team All Big South as a freshman at UNCA before transferring. Despite losing three quality big men, the Cardinals will again have five quality big men available –one more than he can possibly give minutes. 7-0 senior Anas Mahmoud (5.7 ppg., 4.0 rpg., 2.1 bpg. in 18.7 mpg.) should take a more consistent hold on the starting center spot, where he provides an unusual combination of length, agility, and skill. He will again be among the leading shot blockers in the conference, and he'll help facilitate offense with his ability to pass the basketball. Mahmoud still isn't strong enough to be a great rebounder, which will make 6-10 junior Ray Spalding that much more important. Spalding (5.9 ppg., 5.5 rpg.) also provides NBA caliber length and athleticism, and he will be the best rebounder among the primary big men. The most highly regarded new arrival for Louisville will be Malik Williams, an athletic, 6-11 top 20 recruit with a strong perimeter jump shot. He's also an imposing shot blocker, which is something this Louisville team will supply in droves. All three players are noticeably thin, but at this point bulky post scorers are so rare that it will only be an issue against a few teams. Louisville also signed a second dangerous stretch 4 in 6-8 top 60 recruit Jordan Nwora. The Cardinals haven't had a stretch four since Earl Clark, and they'll have the ability to keep one on the floor at all times this season. 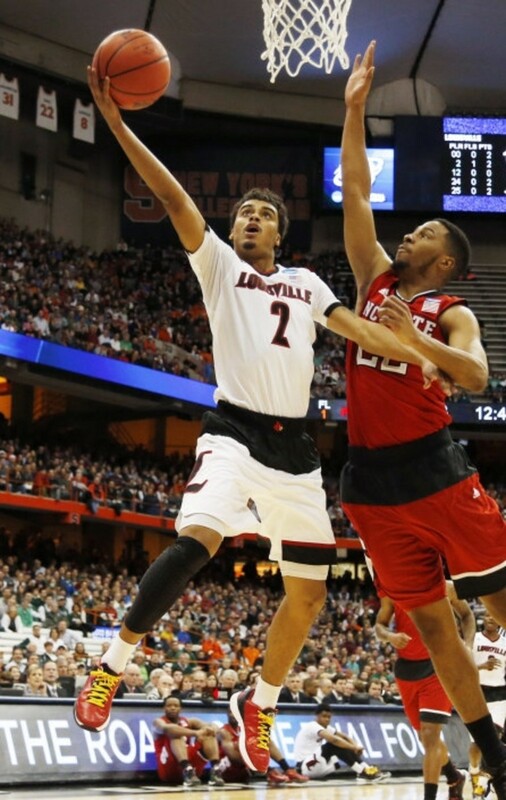 Louisville's ability to spread the floor will open driving lanes for Quentin Snider and make offense significantly easier for the Cardinals. A third four star freshman, 6-10 Lance Thomas, is more of work in progress, but he should eventually display similar skill and athleticism to Williams. Choosing Padgett to take over for Pitino at least means that Louisville will have continuity with regards to style of play; after three years as a player and three more as an assistant under Pitino. Padgett knows the system inside and out. With the same defensive scheme in place, Louisville will again be one of the longest, most athletic groups in the country, and should pick up where they left off a year ago at the defensive end when they finished 20th in the country in fg% defense, 33rd in 3pt.% defense, and 10th in blocks. Rebounding may fall off slightly (they were 23rd a year ago) with younger, lighter interior players, but it will still be a strength. While the team will play without a secondary ball handler in the backcourt, the addition of skilled big men that can stretch the floor should improve offensive flow. Donovan Mitchell will be missed, and it may take some time for the team to adapt offensively just as it did a year ago, but based on talent the Cardinals would be a threat to reach the Final 4 in 2018 in the now unlikely scenario of postseason eligibility. David Padgett will have a one year golden opportunity to prove himself as a head coach, although if he is able to earn a permanent position the roster will likely look very different over the next few years. Dec. 14 pre-conference update: David Padgett is running the same system and on paper the numbers are very similar, but Louisville simply doesn't have the swagger of a Rick Pitino team. A road loss to Purdue was understandable, but a road loss to a flawed Seton Hall team that the Cardinals should have smothered with their pressure should be cause for concern, and the team's best win was against a struggling Indiana team. It appears that the program will somehow avoid an immediate postseason ban, but an NCAA berth is hardly a given at this point. Their length will be a huge advantage in conference play, but Louisville doesn't pass or shoot the 3 well (the Donovan Mitchell void is not being filled), which will make them vulnerable in the ACC. Jan. 30 update: Louisville has effectively held serve against the softer portion of their ACC schedule, and should have no problem reaching the NCAA Tournament. The decision to give Darius Perry more opportunities should help the team at both ends of the floor, although Padgett's commitment to spot up shooter Ryan McMahon, who doesn't help facilitate the offense or take care of the basketball and actually hurts the Cardinals at the defensive end, should be considered a source of concern. If Perry is eventually able to replace McMahon in the rotation, Louisville could again be a factor in March. Feb. 23 update: Louisville faced a backloaded schedule and reality has finally set in: the team simply is not as confident, aggressive, or well coached as they were under Pitino. Three highly regarded freshmen, including five star recruit Malik Williams, have shown very little in terms of either opportunity or development; the team has instead relied heavily on returning players to simply repeat what they were already doing, which doesn't bode well for next season. If the Cardinals could win two more games including the ACC Tournament they would likely still receive an at large bid to the NCAA Tournament, but with road games at NC State and Virginia Tech and a home game against UVA that will be a very tall order. Matt Farrell may have spent some time in the weight room after his sophomore year. The next man up at point guard was Matt Farrell, who looked like a completely different player than the one that played sparingly until the end of his sophomore year. Farrell (14.1 ppg., 5.4 apg., 42.0% 3pt.) improved his conditioning and ran the offense with confidence and aggression throughout the season; his leadership at both ends of the floor will become even more important as the team gets younger on the perimeter. Sophomore Temple Gibbs is the most likely candidate to replace Steve Vasturia in the backcourt. Gibbs seemed to hit a wall in February, averaging 3.6 points per game and hitting just one of his last 15 three pointers after averaging 5.6 points on 42.1% 3pt. to start the season. Still, he took good care of the basketball as the backup point guard and is certainly capable of shooting behind the arc. Junior Rex Pflueger will fill one of the forward spots; he hasn't looked to score very often to this point, but he shot the ball very well when he did as a sophomore and could score more as an athletic 6-6 player with a strong jumper (39.7% 3pt). 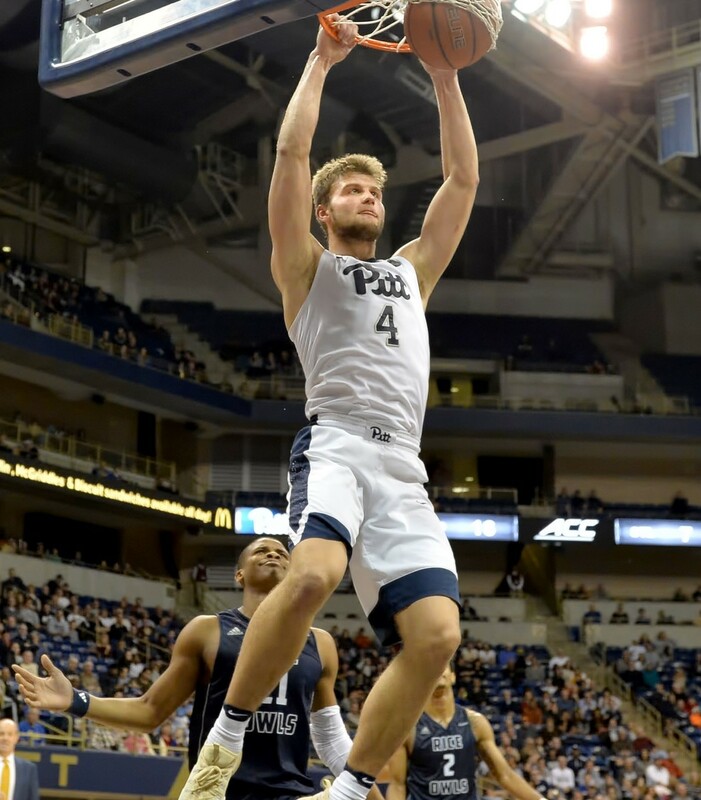 Pflueger usually concentrates more on the defensive end, where he spends most of his time locking down the opponents best scorer; it was his move to the starting lineup that helped end a streak of five losses in six games and spurred the team to an 8-2 finish in the ACC. Freshman D.J. Harvey could eventually start, although Brey doesn’t usually play freshmen for big minutes and Harvey struggled with shot selection at times in high school. Still, Harvey is an athletic, 6-6 top 50 prospect that is an aggressive and capable scorer who would help Bonzi Colson on the boards. Due to the limited number of perimeter options, redshirt freshman Nikola Djogo could see time in the rotation as well. At 6-7, Djogo is a capable shooter and passer that should allow the team to remain efficient offensively and could also help with rebounding. Bonzie Colson was the frontcourt for Notre Dame last season, dominating the boards, scoring in the post, and protecting the rim while staying out of foul trouble despite being just 6-5 and often serving as the only big man on the floor. Colson (17.8 ppg., 10.1 rpg., 43.3% 3pt.) was in the running for conference player of the year and should be again, even though he might have been a late first round pick if he had entered the draft. 6-10 senior Martinas Geben (3.4 rpg. In 12.4 mpg.) began the year starting at center, but his lack of skill and mobility means he doesn't provide much more than post defense and defensive rebounding. 6-7 senior Austin Torres offers more mobility, but has many of the same limitations. Brey will have other options in the frontcourt as well, as burly 6-9 junior John Mooney could be ready to contribute as a rebounding stretch four, while 6-9 sophomore Elijah Burns, originally a four star recruit, would offer more athleticism than the other frontcourt alternatives. While there are improving options for Brey to keep a second big on the floor, the Irish will likely continue to spend a significant portion of games with Colson surrounded by four perimeter players, a lineup that optimizes their offensive efficiency while allowing them to defend the perimeter at the defensive end. Despite the graduation of Vasturia and Beachem, this Irish team should be remarkably similar to last years. They're consistently one of the most efficient offensive teams in the country (2nd in the nation in assist to turnover ratio and 38th in 3pt.% a year ago), but they'll give up points as well. They'll be particularly vulnerable to athletic size at the defensive end, and rebounding will be a challenge (the were 257th in rebounding margin a year ago), although they do pressure the basketball successfully (69th in steals). 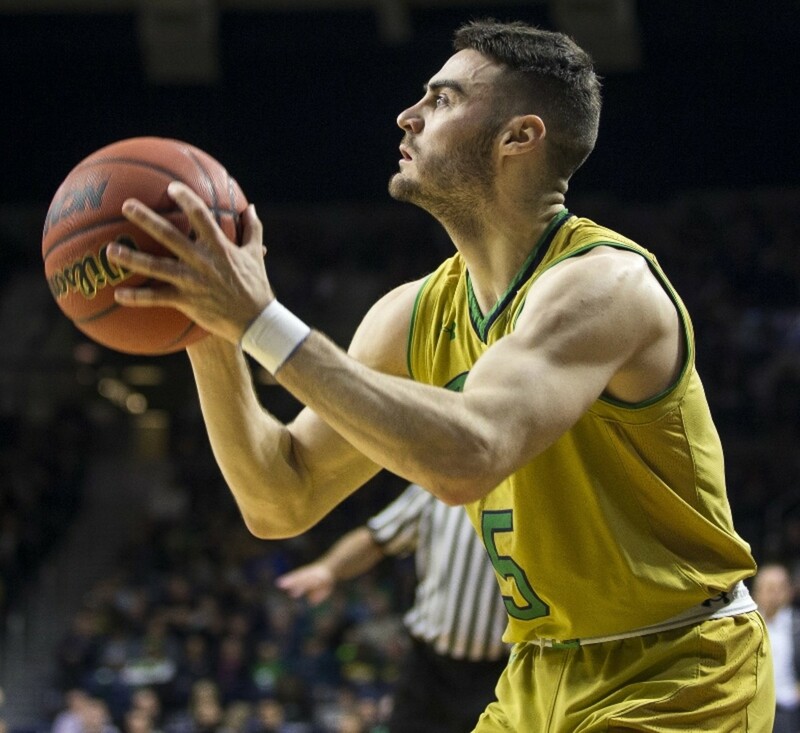 With senior leadership from Matt Farrell and Bonzie Colson, Mike Brey's Irish should again find their way into the NCAA Tournament and be a tough out when they get there. December 14 pre-conference update: Notre Dame's pre-conference performance featured a win against one national title contender in Wichita State and a road loss to another at Michigan State – and then there was the loss to a currently 6-4 Ball State team where they were dominated on the boards 40 to 26. That doesn't bode well for their games against UNC and Duke, but their offensive efficiency should make them the favorite in almost every other conference game they play (they are currently 20th in overall fg%, 10th in 3pt%, and 4th in assist to turnover ratio). Bonzie Colson will again be in the conference player of the year conversation (19.5 ppg., 9.6 rpg., 2.1 spg., 2.3 bpg. ), while D.J. Harvey and John Mooney are gradually providing more help off the bench. The most important improvement has been from TJ Gibbs, who is currently averaging 14.3 ppg. on a sizzling 53.2% from behind the arc. Mike Brey's Irish will again be in position for a deep run in March. January 3 Update: The loss of Bonzie Colson for the majority of the ACC season will make reaching the NCAA Tournament significantly more difficult for the Irish, but the conference appears to only have 5 really strong teams, and Mike Brey's offensive system should keep the team in games against everyone else. Colson should be back by Tournament time, when the Irish should be able to pick up where they left off last year. January 17 Update: The Irish will be working with a limited perimeter rotation of four players, including Nikola Djogo, with D.J. Harvey out until mid February. The injuries will be taken into account by the selection committee and the Irish should still get in and be at full strength by Tournament time, but ACC play just became much more complicated. January 30 Update: Notre Dame is desperate for the return of Matt Farrell (they only have 3 healthy perimeter players), but the team should still be at full strength and quite formidable by Tournament time. The Irish may actually benefit from the absence of so many of their best players, as John Mooney is emerging as a significant offensive threat as a stretch 4 (14.0 ppg. over the last 3 games, 46.5% 3pt.% on the year). February 23 Update: With Matt Farrell on fire since returning from an ankle injury and Bonzie Colson apparently on the way back, Notre Dame is making a mad dash push for an at large bid in the NCAA Tournament. While they don't necessarily need to win at Virginia and the committee does take injuries into account, the Irish will have to make a run in the ACC Tournament (or win that Virginia game) to get in. With the team's recent track record, they can't be counted out. The departure of Geno Thorpe leaves Syracuse extremely limited offensively. Syracuse followed their surprising Final Four appearance two years ago by missing the NCAA Tournament for the second time in three years, and that was compounded by the departure of head coach in waiting Mike Hopkins. Jim Boeheim will again be working with a mostly young squad after losing a great deal of production and leadership to graduation and the draft, but the late addition of a promising graduate transfer should again keep the Orange competitive. Geno Thorpe had a remarkable season at South Florida last year. His team was horrible, particularly at the offensive end, and Thorpe was the only member of the team's regular rotation to finish the year with more assists than turnovers. Thorpe (15.1 ppg.) managed to dish out 4.6 per game despite a poorly organized offense, and he shot 37.5% behind the arc despite a lack of passing other than his own. Even with the move to the ACC (and the AAC is a thoroughly respectable conference), he should have a strong senior year at Syracuse with a better designed offense and more talent around him. At 6-4, he also led his team in steals by a wide margin, and will fit in perfectly to Boeheim's zone. Thorpe's arrival means that Boeheim will not have to turn the keys over to junior Franklin Howard, although Howard could certainly still be a major contributor and possibly allow Thorpe to play off the ball at times. Howard is 6-5 and has all the physical tools Boeheim could want in a guard; he's an excellent defensive player and passer that easily led the team in both steals per minute and assists per minute, but sometimes he can't hit the broadside of a hyperbolic barn, and he also turned the ball over more than anyone else. Most of those assists were early in the season before his confidence was lost, but he's capable of doing some great things. Even if Howard struggles, Boheim also has 4 star freshman Howard Washington at point guard. At 6-2, Washington doesn't have Howard's physical gifts, but he's a smart player and true point guard that would provide additional stability to the position. Syracuse still has potential NBA talent available with 6-6 Tyus Battle, who is currently projected as a 1st round pick in next year's draft. Battle (11.3 ppg., 36.6% 3pt.) had a solid but not spectacular freshman year, but he should turn into offensive option number 1 as a sophomore. Oshae Brissett, a 6-6 4 star prospect, could start at small forward; he's a fluid athlete with a high motor likely to provide more help at the defensive end as a freshman. Thorpe's arrival gives Boeheim significantly more options with his perimeter rotation and a fighting chance to remain reasonably efficient offensively (Syracuse was 45th in assist to turnover ratio last season), and he provides a young group with veteran leadership. Sophomore Paschal Chukwu will step into the starting center spot after missing almost all of last season with an eye injury. The 7-2 Chukwu was only able to play in 7 games, but he posted excellent rebounding and shot blocking rates (2.0 bpg. in 15.4 mpg.) and will provide a strong base for the Orange defense. He'll be backed up by 4 star freshman Bourama Sidibe, who at 6-10 is more mobile and athletic than Chukwu with similar strengths and weaknesses. Neither is much of a scorer. 6-8 Matthew Moyer, a top 80 recruit that was also a medical redshirt last season, will likely start at power forward after the late departure of Thompson. Moyer has gotten stronger and improved his perimeter shooting since arriving at Syracuse, but Boeheim will need him to contribute on the boards right away for the Orange to be successful. Marek Delezaj, an athletic and skilled 6-9 4 star recruit, has loads of potential as a scorer, but he is very thin at this point. Without Thompson, he'll get his chances as well. Despite being on the NCAA bubble and playing in the NIT, Syracuse was a horrible road team last season, finishing 2-11 in road and neutral court games. Part of the problem was at the defensive end, where Syracuse can normally be expected to provide a suffocating zone but struggled with more offensive minded and less physically imposing players (the Orange finished 131st in fg% defense). That should be corrected with a more athletic and defensive minded group, but the obvious tradeoff will be a step back offensively (they were 47th in 3pt.%) as Lydon, White, and Thompson are replaced by less skilled players and the team will play without a post scoring threat. Syracuse has also become significantly younger, and rebounding will likely remain a problem (236th in rebounding margin last season) as Thompson's departure leaves them undersized overall, so the team's road struggles are likely to continue. While Thorpe should prevent them from becoming overwhelmed at the offensive end, Syracuse is likely too young to be a NCAA Tournament contender, and the Orange could make back to back NIT appearances for just the second time in Jim Boeheim's remarkable 42 year tenure. December 1 Update: The departure of Geno Thorpe leaves the Syracuse offense in the hands of Franklin Howard, who has played well to this point in the season (15.7 ppg., 6.0 apg., and 2.5 spg. through 6 games). Oshae Brissett has taken the third most shots on the team with over 12 attempts per game despite shooting just 32.4% overall and 25% from 3, which can't possibly be a good sign. Scoring is likely to become a major issue for the Orange once conference play begins. December 19 pre-conference update: The Orange will bring a stifling defense that can compete with anyone, including Duke and North Carolina, on the boards (4th in the country), generate steals (20th), and block shots (24th), but the offense is simply horrendous. Tyus Battle (21.5 ppg., 37.7% 3pt.) is really the only player shooting a respectable percentage and taking more than a few shots per game, with the team as a whole ranking 239th in overall field goal percentage, 316th behind the arc, and 195th in assist to turnover ratio. The gaudy rpi number Syracuse will bring into conference play should ultimately help build resumes for the rest of the conference, but the odds of the Orange being successful themselves likely went out the door with Geno Thorpe. February 23 update: Syracuse is still very much in the NCAA Tournament conversation despite an absolutely atrocious offense (282nd in overall fg%, 305th behind the arc, and 266th in assist to turnover ratio). The team only has three players (Tyus Battle, Frank Howard, and Oshae Brissett) that can score, but on nights when that group is shooting well the Orange are still fairly dangerous. Road games at Duke and BC (who can shoot over a zone as well as anyone) and a home game against Clemson still make an NCAA appearance seem like a stretch, but Jim Boeheim is working miracles again in Syracuse. March 12 Pre-Tournament Update: The Orange bizarrely received an NCAA bid over Louisville and Notre Dame, and feature one of the worst offenses in college basketball. However, they may be able to win by dominating the boards (the Sun Devils don't rebound well) and suffocating an Arizona St. offense that has struggled since a strong start to the season. If they do, TCU is not the same team without Jaylen Fisher, and the Horned Frogs (a horrible defensive team that could make Syracuse look competent) will be vulnerable to Syracuse as well. If you haven't seen Boston College play (which is totally understandable), Ky Bowman is good. Depressingly, last season's 2-16 finish was actually an improvement for Boston College. The team lost several respectable players to graduation and continued the trend of hemorrhaging talent through transfers; however, the addition of a late graduate transfer does offers hope for the upcoming season. 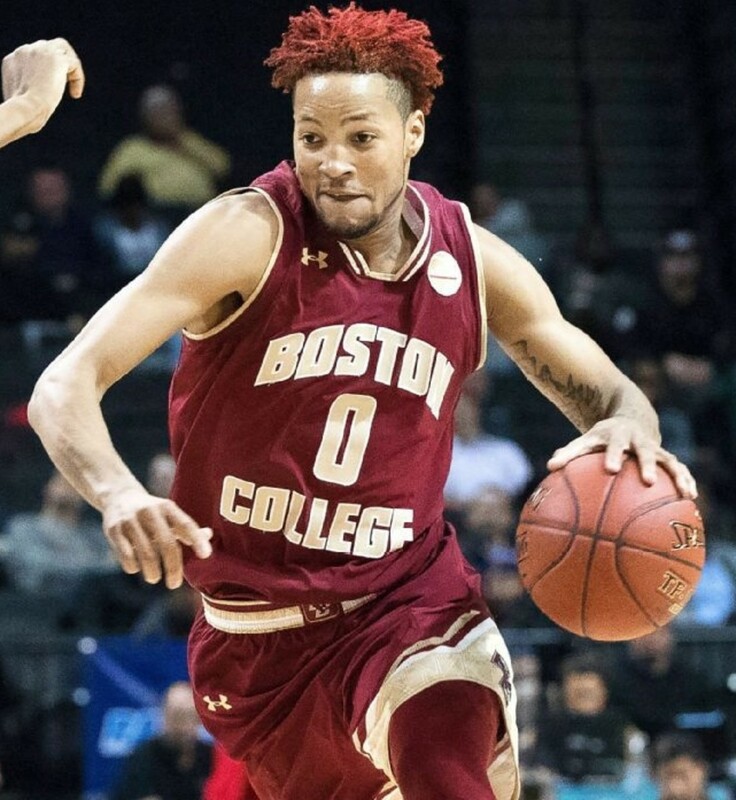 Last season actually got off to a promising start for BC, as the emergence of freshman Ky Bowman as a dangerous complement to Jerome Robinson led the Eagles to late non-conference wins against Auburn and Providence and early ACC wins against Syracuse and NC State. Although it went virtually unnoticed on a 2-16 team, Bowman was one of the better players in the ACC last season. After earning big minutes in the Auburn game, he averaged 17.3 points on 47.2% 3pt. shooting to go along with 3.4 assists and, at 6-1, an amazing 5.8 rebounds over the teams last 23 games. The 6-5 junior Robinson (18.7 ppg., 3.9 rpg., 3.4 apg., 1.7 spg., 33.3% 3pt.) put up gaudy numbers as well, and the pair was eventually joined by a third high end shooter in Jordan Chatman, who averaged 11.1 points on 44.9% 3pt. shooting over the team's last 15 games. Unfortunately, his emergence as a perimeter threat and consequent, ill-advised move into the starting lineup is a major reason A.J. Turner isn't around anymore. The Eagles' perimeter can score, but they didn't pass the ball very much last season; the team finished the year 191st in assist to turnover ratio, and Turner was by far the best passer. The early June signing of graduate transfer Deontae Hawkins is a potential season changer for Boston College. Hawkins (14.0 ppg., 6.5 rpg.) led a strong Illinois St. team in scoring and rebounding last year. He's a high end stretch four that shot 44.3% on 70 made 3s, and at 6-8 he should represent a slight upgrade to Connor Tava as a rebounder. The only returning major contributor in the post will be 6-11 sophomore Nik Popovic, who doesn't offer much mobility or athleticism but can at least rebound his position (6.1 ppg., 3.5 rpg. in 13.8 mpg.) and will even hit an occasional three. 6-10 sophomore Johncarlos Reyes will provide the teams only semblance of rim protection as his backup. Steffon Mitchell, a two star prospect that was subject to a late growth spurt to 6-8, 222 pounds, played so well during preseason practice that redshirt sophomore Mike Sagay opted to transfer. He could provide a more traditional small forward or a stretch 4 similar to Hawkins off the bench. The Eagles also signed Vin Baker Jr., who was unranked by most recruiting services but grew from a 6-3 guard to a 6-9 forward in a little over a year. He's obviously pencil-thin at this point, but at 6-9 with perimeter skills he could eventually be a major contributor. Boston College actually shot the ball relatively well a year ago (66th in 3pt.%) without a stretch 4. With the addition of Hawkins, the Eagles will have as much perimeter shooting as anyone, and their ability to spread the floor should encourage passing and help improve offensive efficiency; they suddenly has the potential to be a very dangerous offensive basketball team. The Eagles will still give up plenty of points (317th in fg% defense a year ago) and get beaten on the boards in the ACC (188th in rebounding margin), but those numbers should improve with a larger frontcourt. Even though this is only Jim Christian's fourth year with the program, the team has performed so poorly during his tenure that he likely has to demonstrate significant progress to stick around. 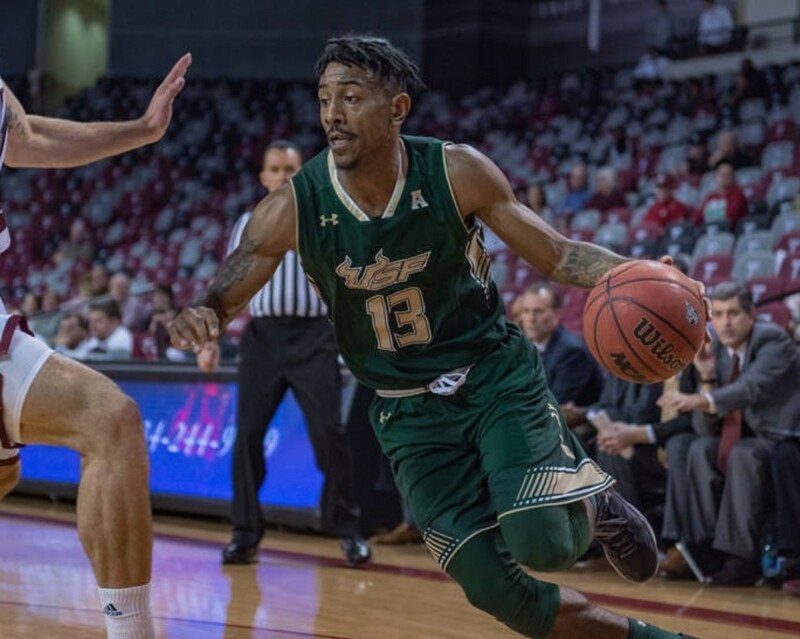 It now seems as though he will have a fighting chance, and if the Eagles fulfill their newfound potential they could play in a postseason tournament for the first time since Al Skinner took them to the Big Dance in 2009. December 6 update: The loss of Deontae Hawkins to a knee injury is devastating for the Eagles. Hawkins was averaging 13.6 points and 10.3 rebounds per game while shooting 34.8% from three prior to the injury, and he was the key to improved efforts defensively and on the boards (the Eagles ranked 71st in fg% defense and 43rd in rebounding margin with his addition). While the perimeter is still loaded with shooters and Steffon Mitchell has been productive on the boards as well (7.0 rpg. ), the Eagles probably won't defend well enough or be efficient enough offensively to reach the NCAA Tournament, but an NIT berth (and what should be a strong returning cast next season) may keep Jim Christian around for another year. Bryant Crawford could attract NBA attention as a junior. Despite a first four loss to Kansas State, last season was a relatively successful one for Danny Manning's Demon Deacons, who returned to the NCAA Tournament for the first time since the Dino Gaudio era. Unfortunately, a key part of that success was the rapid development of John Collins, and his departure for the NBA will complicate an immediate return. Collins wasn't the only strength of Danny Manning's Deacon's a year ago, as the team's offensive efficiency skyrocketed (40th in overall fg%, 36th in 3pt%, and 34th in assist to turnover ratio) due to an improving collection of perimeter talent, most of which will be returning. The leader of that effort is junior Bryant Crawford (16.2 ppg., 3.8 rpg., 5.5 apg., 1.5 spg., 34.6% 3pt. ), who as an explosive, playmaking 6-3 point guard should attract NBA attention with another year of improvement. The biggest new addition to last year's team was transfer Keyshawn Woods (12.5 ppg., 4.2 rpg., 3.5 apg., 43.8% 3pt. ), who picked up where he left off at Charlotte by shooting the lights out in addition to doing everything else Danny Manning could have asked of him, including finishing second on the team in assists, third in rebounds, and at a sturdy 6-3 somehow holding his own at the 4 in four guard lineups. Unfortunately, with Mitoglou's departure he will be forced to do even more of that this season. Joining that duo should be Chandee Brown, a top 40 recruit who at 6-5 will give the Deacons another strong, physically explosive perimeter presence. Brown is an aggressive scorer that would be an upgrade to Austin Aryans defensively and on the boards, although he is also likely to spend time as an undersized power forward. Mitchell Wilbekin (7.0 ppg., 40.5% 3pt.) had a bounceback junior season, and could return to the starting lineup with the team being forced to play small. A second key addition last season, Brandon Childress, will look to build on a strong freshman year. 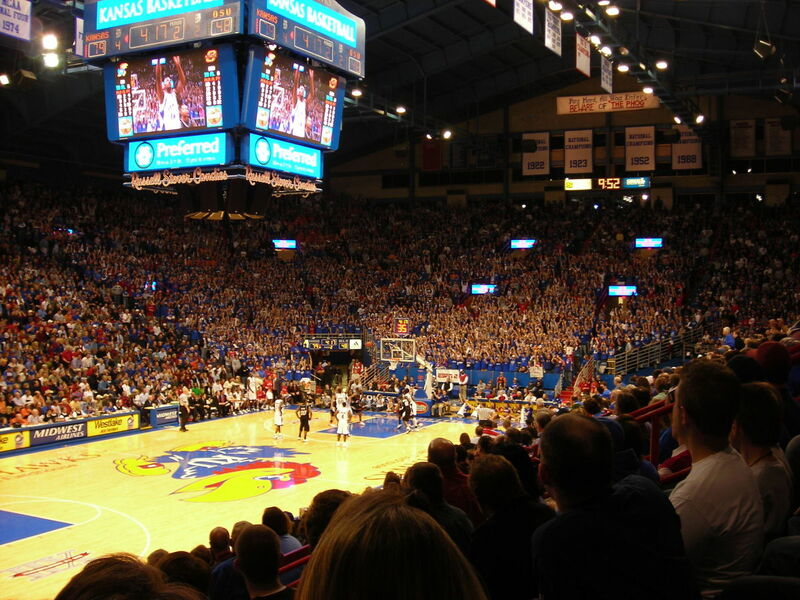 At 6-0, Childress (6.6 ppg., 35.1% 3pt.) uses his quickness well at both ends of the floor, and he seems to have all of his father's confidence and some of his ability to shoot the ball. Despite playing with with four perimeter players for significant stretches of time, the Deacons were able to remain competitive on the boards (97th in rebounding margin) due to Collins' ability to cover a very large area as a rebounder. With the surprising late departure of Dinos Mitoglou, Wake will be forced into those lineups more often this season, but without Collins in the middle they won't be nearly as successful. Athletic 7-1 junior Doral Moore still has loads of potential, but if anything he digressed as a sophomore, averaging 2 personal fouls in just 8.4 minutes a game. If he could overcome bad instincts at the defensive end, he could allow the Deacons to pick up where they left off, but that didn't seem very likely last season. 6-11 freshman Olivier Sarr, a 4 star recruit from France, could eventually be the answer and may already offer more rim protection than Collins, but he likely won't be strong enough to be a dominant force as a freshman. He does offer some skill as a passer and spot up shooter, so he could at least provide some help at the offensive end. Neither player provides a post scoring threat at this point. Manning did add graduate transfer Terrence Thompson after losing Mitoglou. Thompson may be the team's best chance to compete on the boards (particularly at the offensive end), although at 6-7, 217 pounds he's unlikely to replicate the numbers he put up at Marshall (6.5 rpg. in 22.3 minutes) in the ACC. His inability to shoot from the perimeter as a power forward would ultimately inhibit the offense, although Manning could elect to go with an extremely small lineup and hope Thompson can serve as a smaller, less productive version of Collins in the post. Last year the Deacons won almost exclusively with offense, finishing 265th in field goal percentage defense and 229th in 3pt% defense; with significantly less talent and size in the frontcourt, that should again be the case, and rebounding will become more of an issue. Offensive efficiency should again be a strength, although that too could decrease without a post scoring threat to draw in defenses, and without Collins (who was an excellent offensive rebounder) second chance opportunities will be less common as well. Danny Manning's team will remain competitive, particularly when 3's are falling, but a return to the NCAA Tournament may be a year away. December 19 pre-conference update: Wake Forest struggled against a very average non-conference slate, and there is little reason to believe that will change once conference play begins. As expected, defense (148th in overall fg% defense, 328th in 3pt% defense) and rebounding (136th in rebounding margin) are major issues, and for some reason the team isn't taking care of the basketball either (203rd in assist to turnover ratio). Doral Moore (11.1 ppg., 7.9 rpg., 2.0 bpg.) has performed well in the middle when he's able to stay on the floor, but he's averaged 2.9 fouls in 21.8 minutes per game, and that problem will likely get worse against ACC competition. Ben Lammers played all the minutes for Georgia Tech. Josh Pastnor seemed doomed to a slow and potentially painful rebuild at Georgia Tech when he took over an NIT team that had lost its top four players to graduation and had little new talent coming in. However, after years of players showing almost no progression under Brian Gregory, Pastnor developed three of the most improved players in the ACC, and he coached a three star prospect into a member of the conference All-freshman team. The Yellow Jackets' appearance in the NIT title game was a remarkable accomplishment relative to the limited talent that seemed to be available, and the program has been quickly reinvigorated and become relevant in recruiting once more. Pastnor eventually put the offense in the hands of senior Josh Heath last season, but he will now have no other choice than to turn to a young point guard. Justin Moore started during the early part of his freshman campaign, but he wasn't able to take care of the ball as well as Heath and needed to get stronger to compete in the ACC. He should have more weight on his 6-4 frame as a sophomore, but he will face competition from 4 star recruit Jose Alvarado. Alvarado will need to add weight to his 6-0 frame, but he is tough and aggressive at both ends of the floor and is the freshman most likely to become a major contributor immediately as Josh Okogie did a season ago. Stephens' departure means that even more of the scoring will need to come from the wings. At shooting guard, Tadric Jackson's efforts were somewhat overshadowed by his teammates, but he took a giant leap forward under Pastnor. Although he ended the season in a shooting slump, he shot 38.3% from 3 over his first 27 games and went from shooting 38.5% overall and 27.7% from 3 as a sophomore to 44.6% and 32.5% respectively as a junior. At 6-2, Jackson's also bizarrely effective scoring in the paint, and has the potential to score more as a senior. Okogie was the overachieving three star prospect; as the most important part of the team's offensive efforts, he scored 16.1 ppg. while shooting 38.4% from 3, and he used his solid 6-4, 207 pound frame to attack the basket and gather 5.4 rebounds a game. If he progresses as much as he did between his senior year of high school and freshman year at Georgia Tech, he might not be around for long. Pastnor added another dangerous wing scorer that will take some pressure off Jackson and Okogie in Curtis Haywood, a 6-5 4 star prospect that should be able to help on the boards as well. Ben Lammers' per minute numbers were actually strong as a sophomore, but he was stuck behind several talented seniors; with minutes, he was the ACC defensive player of the year and second team all conference. Lammers finished 3rd in the country in blocked shots with 3.4 per game, 3rd in the ACC in rebounds (9.3 per game), and 2nd on the team in scoring (14.2 per game). His most impressive stat was his 35.4 minutes per game (he sat a total of 29 minutes over the last 13 games), and he somehow managed to remain effective defensively and stay out of foul trouble even when he was clearly tired. It will be impossible to expect more from him as a senior, but retaining his production and minutes will be essential for the Yellow Jackets; the dropoff from Lammers to backups Abdoulaye Gueye and Sylvester Ogbonda is steep, and Georgia Tech can't afford it for very long. Lammers' production will also be particularly important because the third player to improve dramatically a year ago was Quentin Stephens, and his efforts will be severely missed. Stephens played almost as many minutes as Lammers, and his length, athleticism, and mobility made him the perfect complement to Lammers defensively and on the boards. The closest thing Pastnor will have to Stephens will be 6-9 freshman Moses Wright, whose last growth spurt came so late that he wasn't even rated by the major recruiting services. He has the potential to be a more skilled, slightly less athletic version of Stephens eventually, but there's almost no way he'll be ready to contribute in the ACC as a freshman. Without a clear power forward, Pastnor is likely to spend significant time with Okogie serving as an undersized but sturdy power forward at the defensive end against ACC teams playing with just one big man. The addition of Curtis Haywood and departure of Quinton Stephens may actually help Georgia Tech become slightly more efficient at the offensive end (Stephens still didn't shoot well as a senior), but Georgia Tech won with defense last season, finishing 13th in fg% defense and 73rd in 3pt.% defense. Without the 6-9 pogostick Stephens playing almost the entire game, those numbers will take a hit, and the team didn't rebound very well even with him in the lineup (209th in rebounding margin). Barring miraculous development from Moses Wright (something that did seem to happen with Josh Okogie a year ago), the Yellow Jackets will again be fun to watch and competitive in the ACC, but Josh Pastnor and company will need to wait for another strong recruiting class or two before breaking into the NCAA Tournament. December 19 pre-conference update: Georgia Tech struggled in non-conference play without their best player, but with Okogie's return and strong play from freshmen Jose Alvarado (12.8 ppg., 5.0 rpg., 4.0 apg., 2.0 spg., 37.5% 3pt.) and Curtis Haywood (8.3 ppg., 3.5 apg., 50.0% 3pt.) the Yellow Jackets will be a very different team that will make for a formidable opponent in the ACC. Ryan Luther will have all the shots he wants if he stays healthy. The only established returning player that Stallings will have is Ryan Luther (5.7 ppg., 3.9 rpg., 40.9% 3pt. ), a 6-9 senior that has not been able to stay healthy. If he can as a senior, he'll get all the shots he wants as a capable stretch 4. Jared Wilson-Frame, a 6-5, 230 pound junior college transfer, will be the most interesting new face for the Panthers; he played point guard last season, but will need to split time between the forward spots for Pittsburgh. Wilson-Frame could lead Pitt in rebounding and help facilitate what little offense the team is able to generate. 6-11 Terrell Brown, a three star prospect, will have to play right away; again, he's thin, but beyond Luther he'll be the only size Pitt has to offer. He does have potential as a shot blocker, and his ability to shoot from the perimeter makes him a solid long term candidate for Stallings's system in the mold of Luke Kornet. Pittsburgh struggled to defend even while loaded with size and senior leadership in Stallings' first year in the ACC (228th in fg% defense, 216th in 3pt.% defense, and 192nd in rebounding margin); without them, the outlook is grim. Jan. 3 Update: Upon further review, the situation at Pittsburgh may not be quite as dire as at Boston College two seasons ago. The team is well coached and competes, and there are plenty of capable shooters. It will likely have to wait until Ryan Luther's return from injury, but with all but five conference teams seriously flawed the Panthers should be able to avoid a winless ACC season, and there are several pieces in place to build on for next season. Jan. 11 Update: Ryan Luther is now out for the season, so yeah, no ACC wins in Pittsburgh. Thank you Tyler. I added updates for the first round of the NCAA Tournament and updated the postseason projections for the ACC Sunday night (that will probably be my last for the year). I didn't write anything new for UVA because their first round game is a 1 vs 16 matchup, and it's not practical for me to write a separate article for the NCAA Tournament because it would only be relevant for a couple of days. Great call with UVA. Any tournament projection coming soon? Thank you Hugh and James! Great call with Virginia. This was very thorough pre-season and now with updates. Best ACC analyst out there. Just wanted to say that this was probably the most accurate ACC preview on the internet. Great work! To the Pitt alum that emailed me about the article (and anyone else that emailed me and didn't receive a response), thank you very much. Unfortunately, there isn't a great way for us to respond to emails, but I'm more than happy to reply to questions in the Comments section. I have to disagree with ND's finish. I think they're going to finish in the top 4 and find their way to the Elite 8. They lost Vasturia and Beachem. Vasturia hurts, b/c he was a stone-cold killer with solid defensive traits, but if Pfleuger can find his touch, he could be better. He already provides more on D. As much as I like Beachem, great guy, just didn't provide the efficiency and really struggled in big games. Gibbs, with a better conditioned body, will really thrive next to Farrell. Also appears like Burns and Geben are ready to play inside, both appear to be much better and better conditioned. They'll be able to keep up with the pace, which allows us to maximize Bonzie's capabilities. He won't have to be stuck inside all the time going up against the bigger guards, he can stretch and be a sort of Draymond Green lite for ND (minus the nutcracker antics). Then add guys like Harvey, Djogo, Mooney and Burns (Torres is hurt), that's a very talented and very experienced unit that can go deep into the tournament and finish strong in the ACC. I hadn't realized the Hokies had lost so many guys late. Blackshear is back, and Walker and Bede will supplement the returning guys. They like to go small ball anyway, but now I see Williams even says it's too soon to say if Clarke will start the season. So I guess you are right, Buzz has his work cut out for him, but he's done a great job there. Thank you. UNC always gets the most out of their new players. I remember a high school teacher that was a Duke fan complaining about Shammond Williams seemingly coming out of nowhere to replace Donald Williams. I thought what Roy Williams did last year was really incredible; I should have known better, but it really surprised me how easily Paige and Johnson were replaced. Anything can happen at North Carolina, but those top 6 ACC teams should all be really good. I originally had Virginia Tech at 4 in the conference, but this has been a really tough couple of months for them. Nice work. This is very detailed. You definitely have Virginia higher than what I've seen elsewhere but you make a good case and at least you aren't parroting the consensus. I'm a UNC fan and you were a little down on them heading into last year but you nailed what their potential shortcoming were. Now they have to see what Roy can do with 3 freshmen bigs. Reminds me of '77 when they made it to the Finals with 3 no-name freshmen bigs (Yonaker, Jeff Wolf and Krafcisin). I think these guys, Huffman, Brooks and Manley, have more upside. Huffman was actually moving up some later ranks (Phenom Hoops had him 70th). Keatts will probably do more with less than Gottfried had. If Clarke is ready to go i think Va Tech may surprise. As for Miami, I think Jimmy Tilda is building a powerhouse (more great recruits in line next couple of years). Wade Walker, you have to click on the word profile after clicking the username. In response to an email about 6-8 forward David Skara at Clemson, he averaged 6.5 points and 3.1 rebounds with a modest 32.8% from 3 in 19.7 minutes per game as a sophomore in the Horizon League (poor production in a weaker league). If he beats out the freshmen for playing time, that may not be a good sign for the Tigers. I'm not completely sure where I claimed to be an "expert," but I have been doing this for six years, not two (the rest of the articles can be found by clicking on my profile), and my overall track record is fairly strong. I was way off base on several fronts last year (I also didn't expect a sudden surge in offensive efficiency from Florida State), but as I'm sure you actually read that article you know there were legitimate reasons behind each of those projections. NC State had far too much talent to finish where they did, no one knew how good Matt Farrell was going to become, and at UNC Marcus Paige had been the heart of the team for four years, Bryce Johnson was awesome as a senior, and there was reason to doubt Justin Jackson and Kennedy Meeks becoming dominant forces prior to the season. Whether my projections are always accurate or not (no one's are), I am fairly certain that these articles provide an informative overview of the conference each year. It has already happened 2 of the last 4 years (with less talent). UVA has 56 conference wins during that period; UNC and Louisville are tied for 2nd with 52 each. Virginia #1. Really? Will never happen.